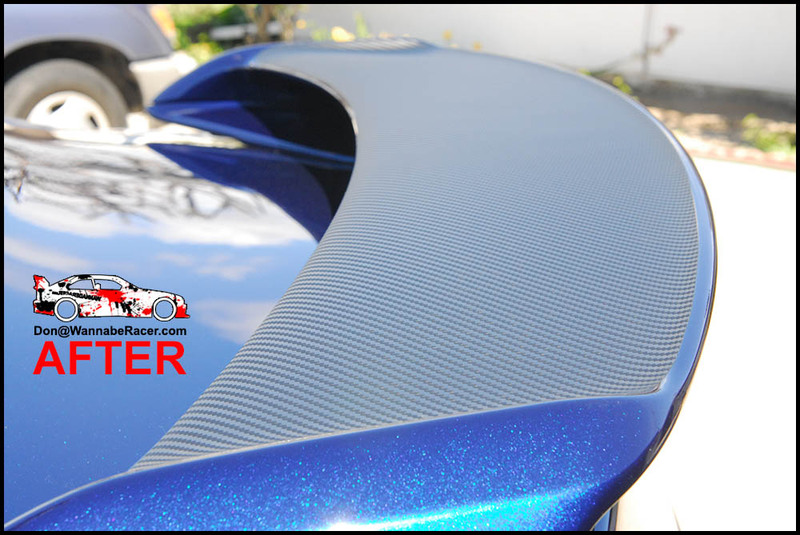 For this blue Nissan R35 GTR, the owner of the car just wanted to add a simple carbon fiber accent to his rear spoiler. 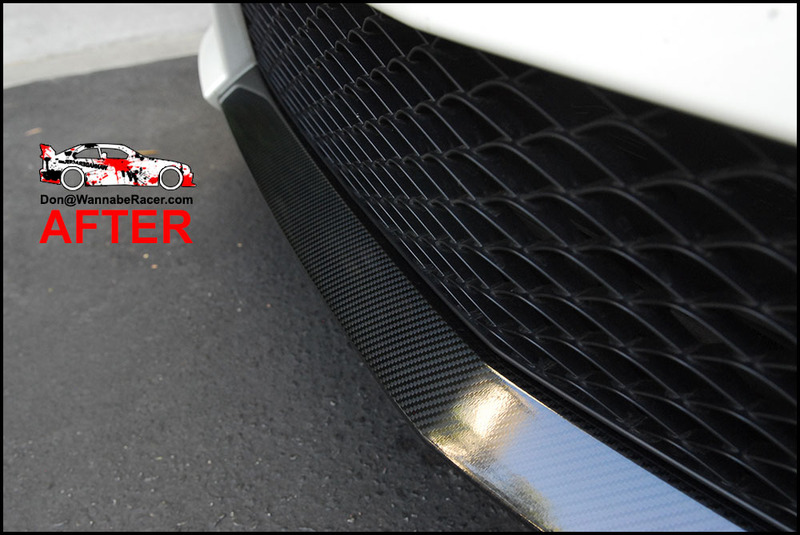 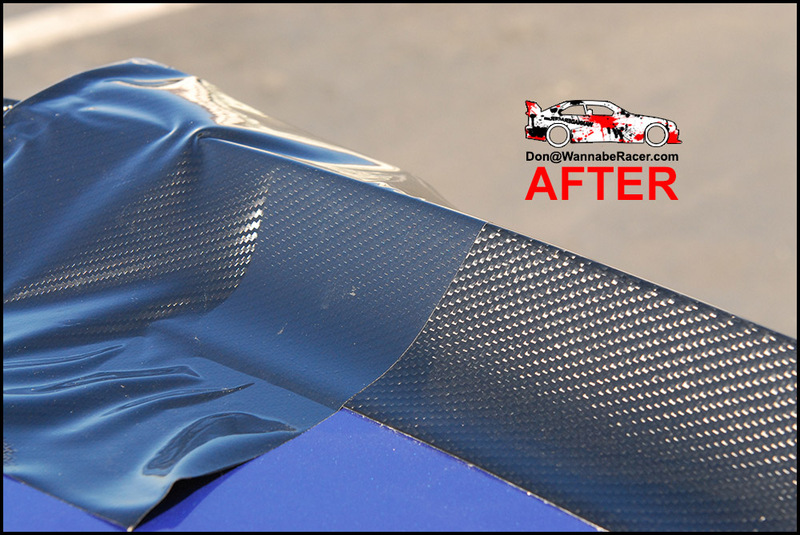 We went with the di-noc matte carbon fiber finish to match his other real dry carbon fiber pieces that were on the car. 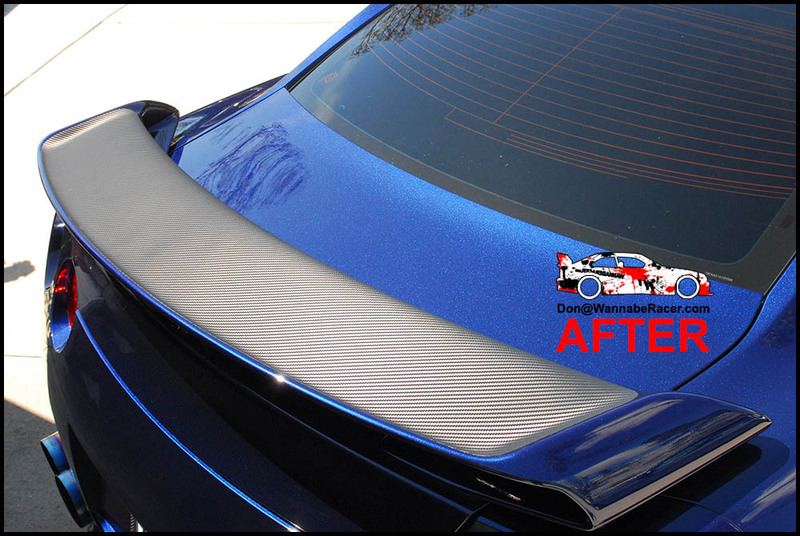 The owner of the car was in Westminster / Orange County and had me come out to him to do the vinyl wrap on his spoiler. 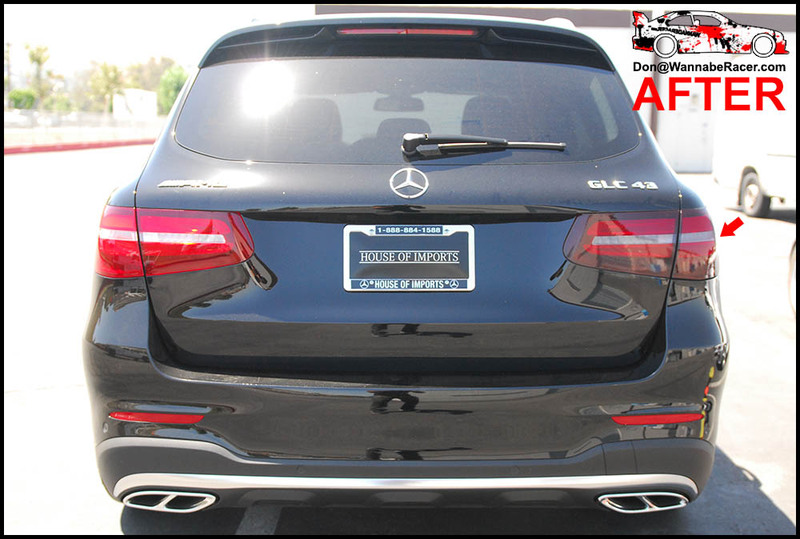 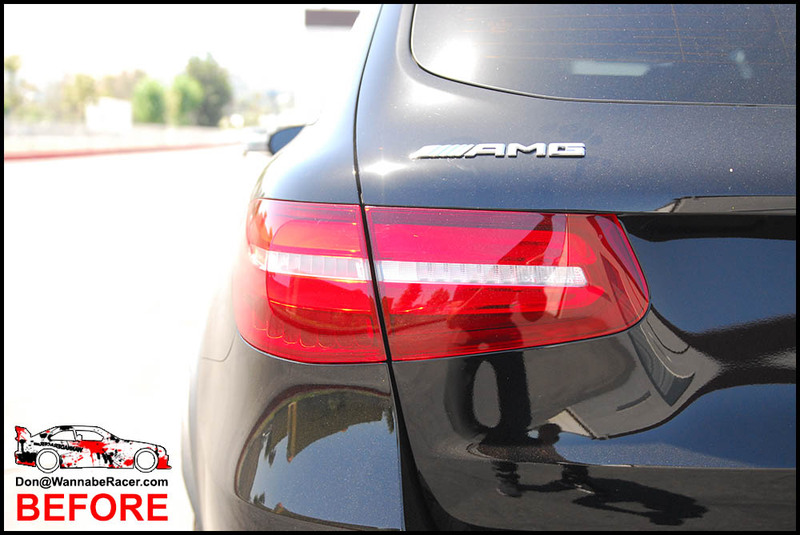 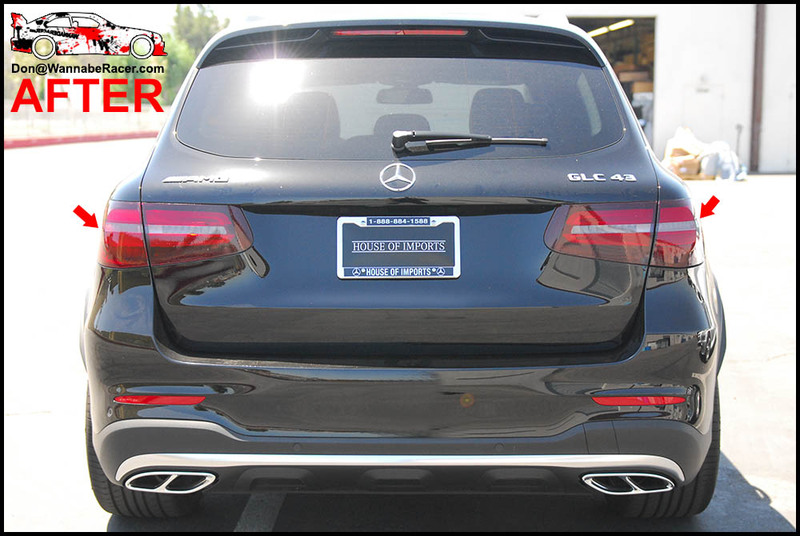 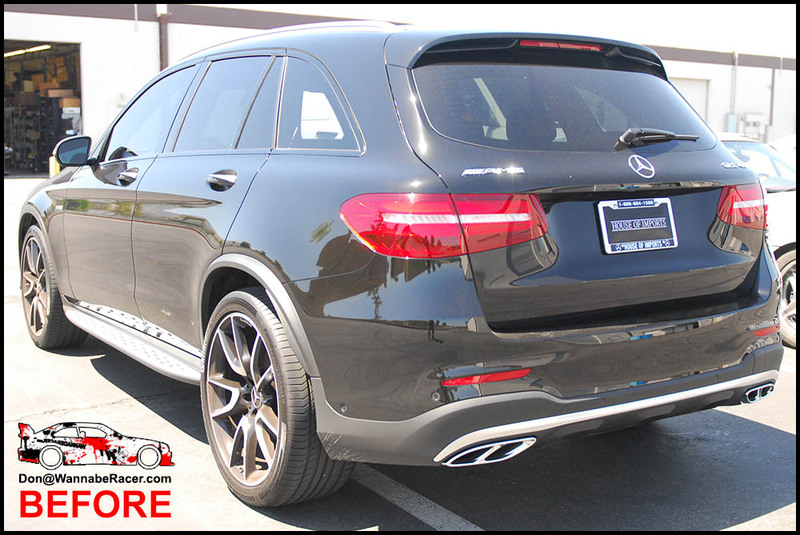 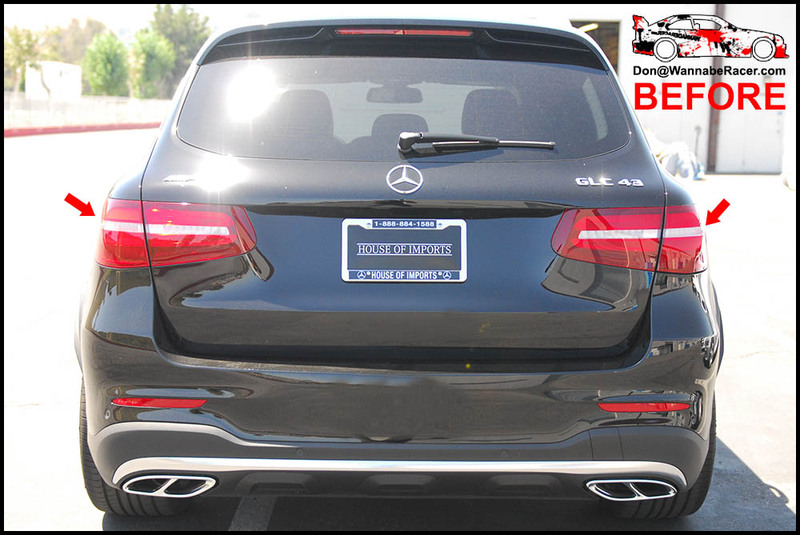 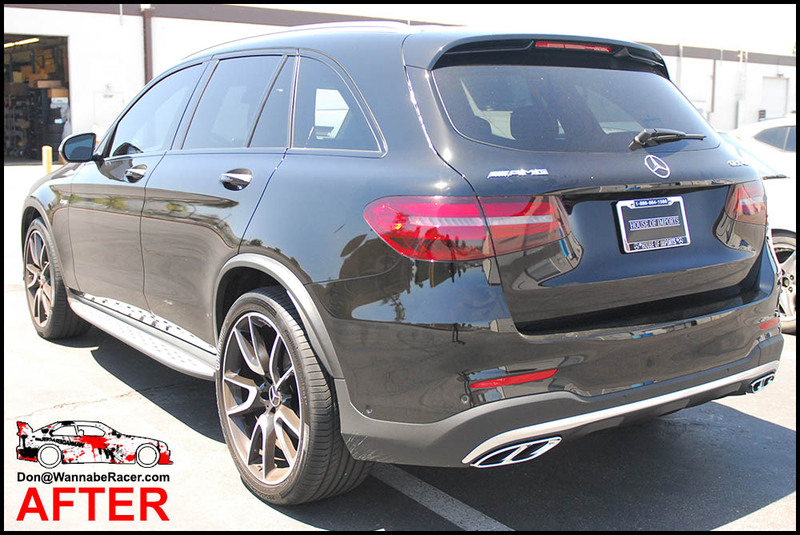 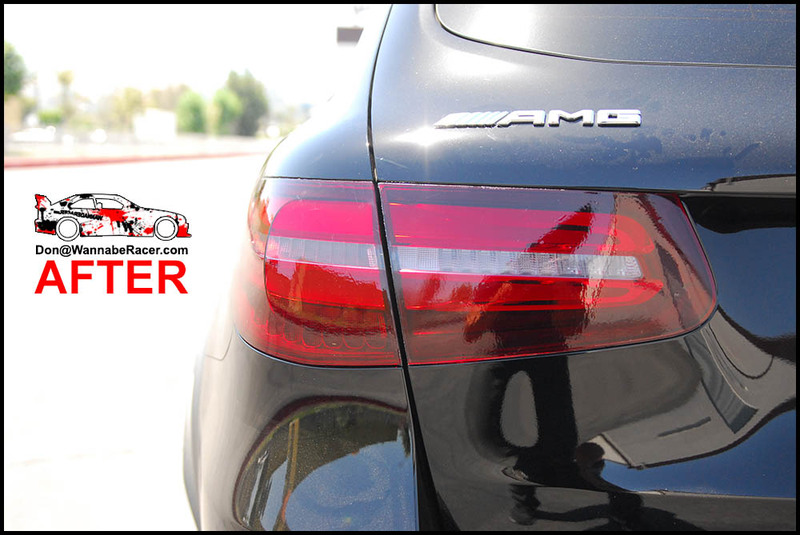 The owner of this black GLC 43 AMG brought his car by to have me lightly tint / smoke the rear tail lights on his car. 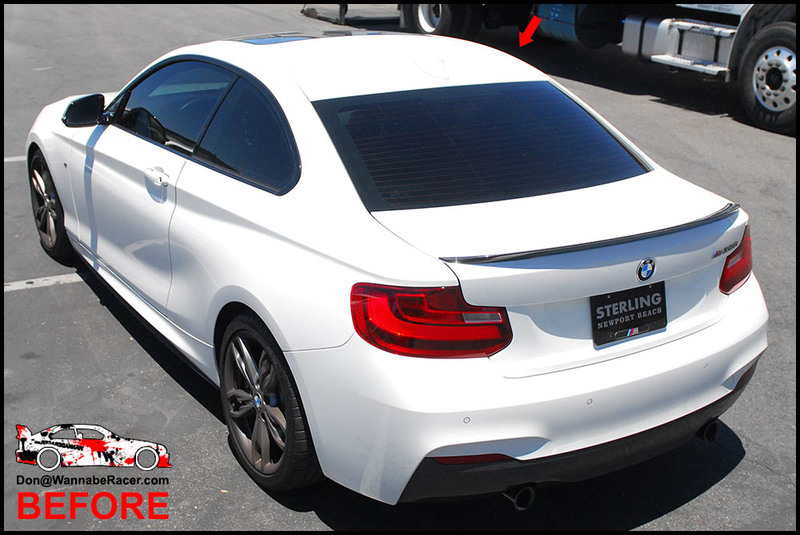 The owner of this car is a returning customer who also had me lightly tint the tails on his other car. 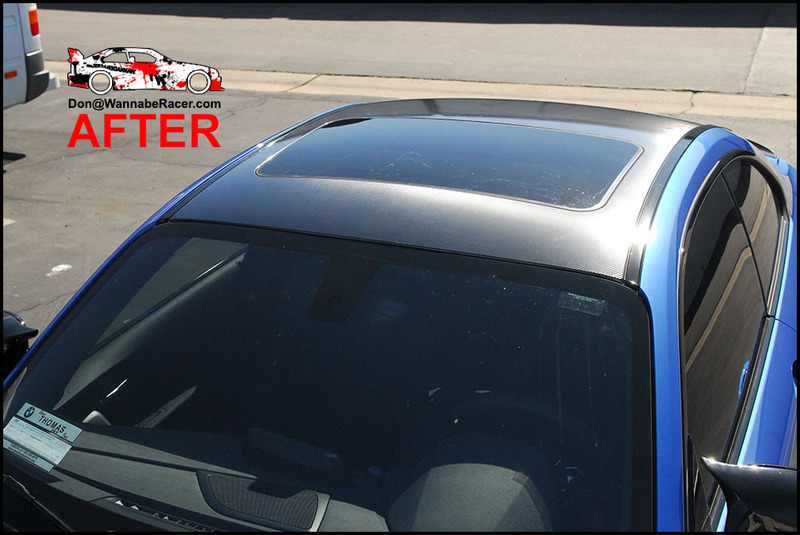 I took pictures of the progress outside, so you guys can see the subtle changes of the tint vinyl wrap that I use. 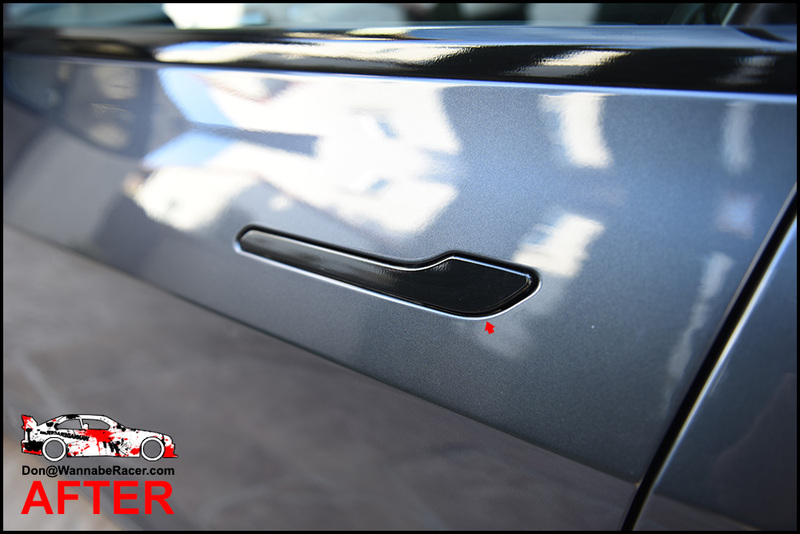 The finish gives the tail lights a nice cherry finish, while still maintaining good light output from the lights and also keeping in line with a very factory / OEM+ type look. 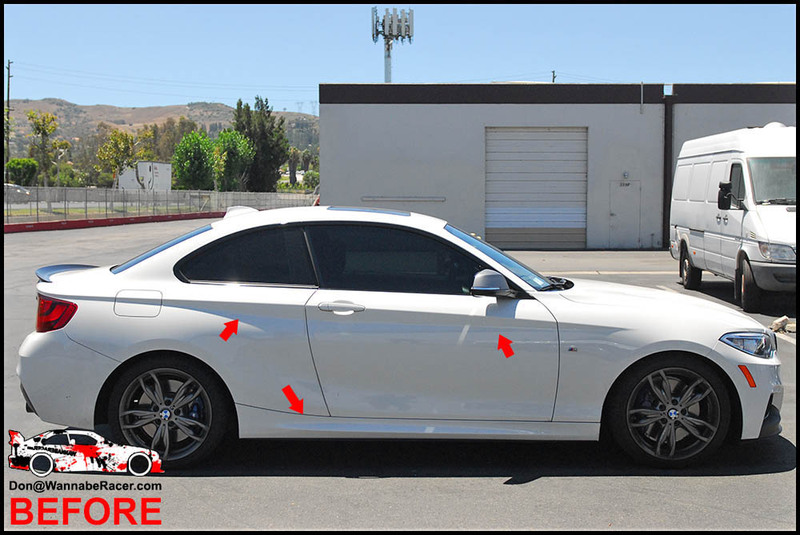 The owner of this car was from Pasadena Los Angeles and drove out to me in Anaheim Hills / Orange County to get the vinyl work done. 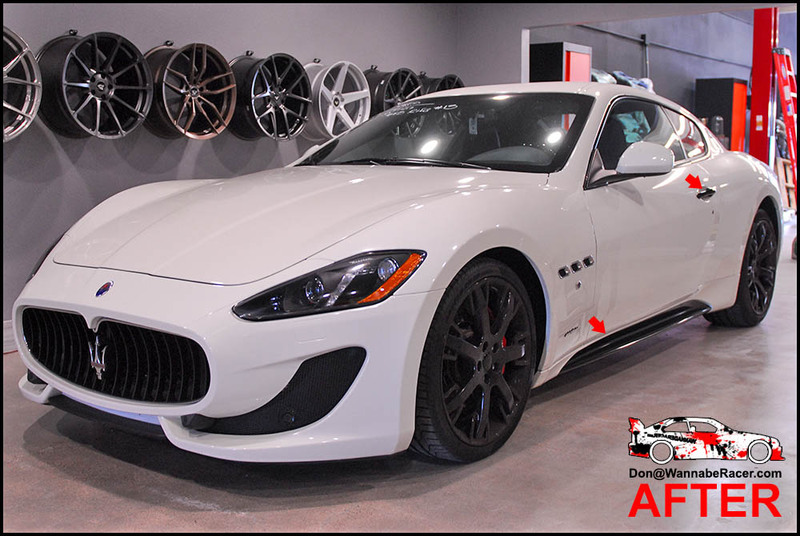 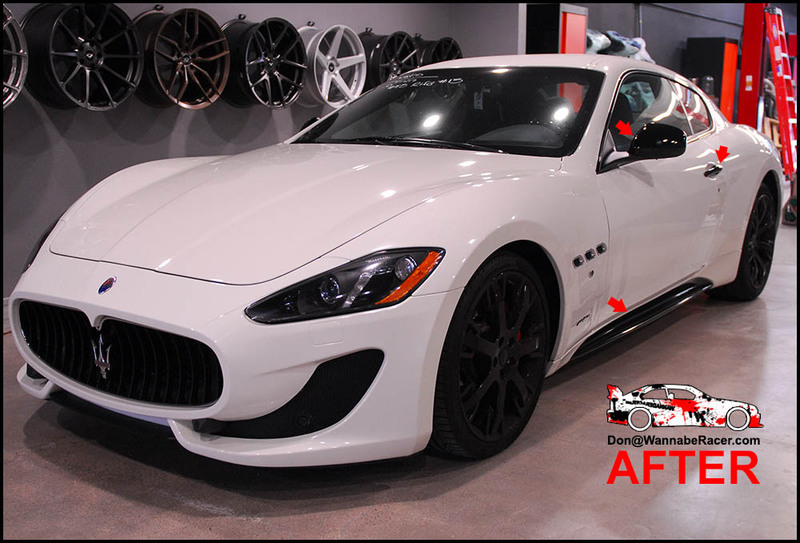 On this white Maserati Gran Turismo, the owner of the car wanted to add some simple accents to the car to make it look slightly more aggressive and give it some character. 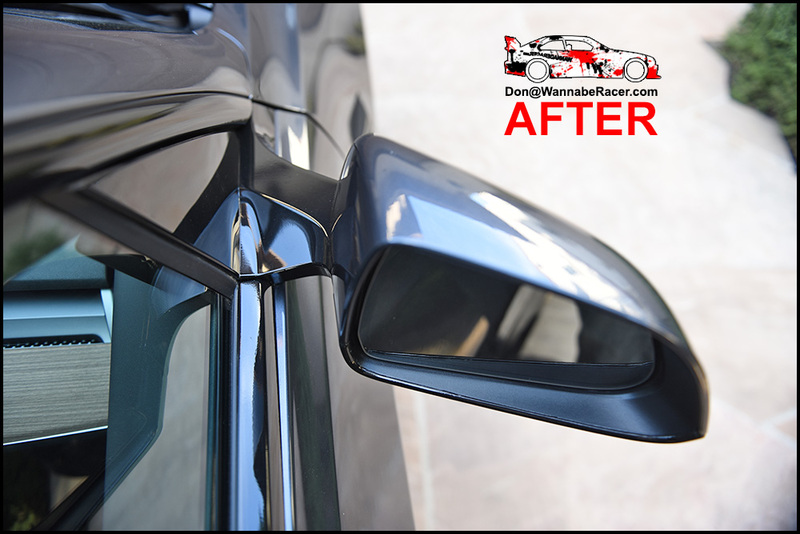 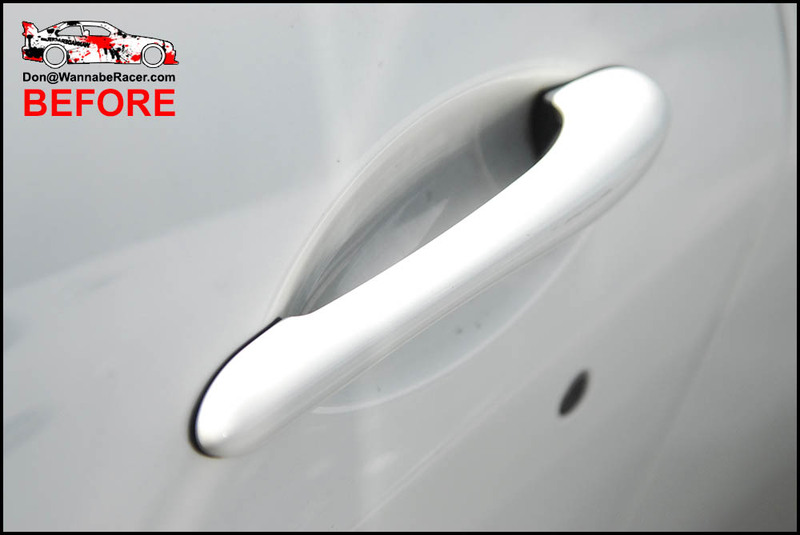 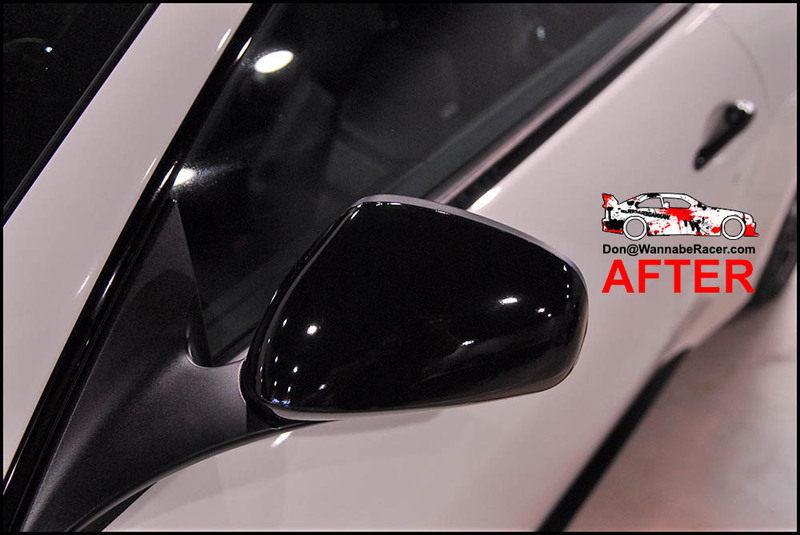 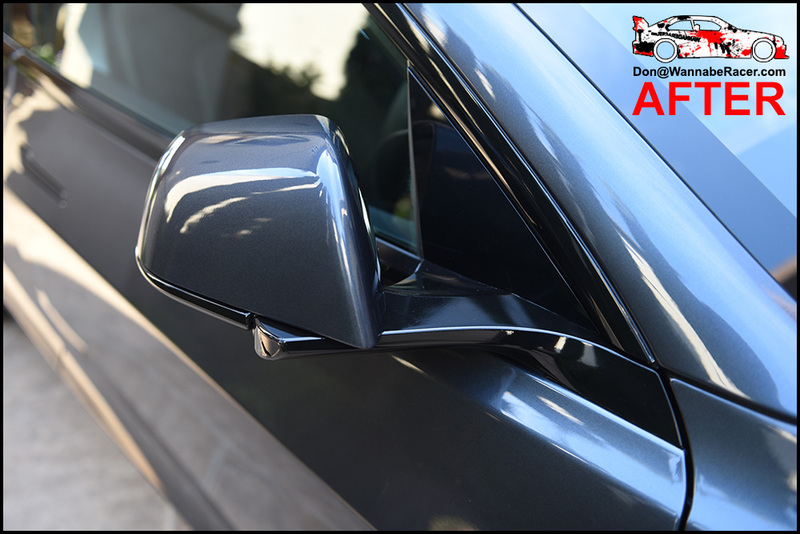 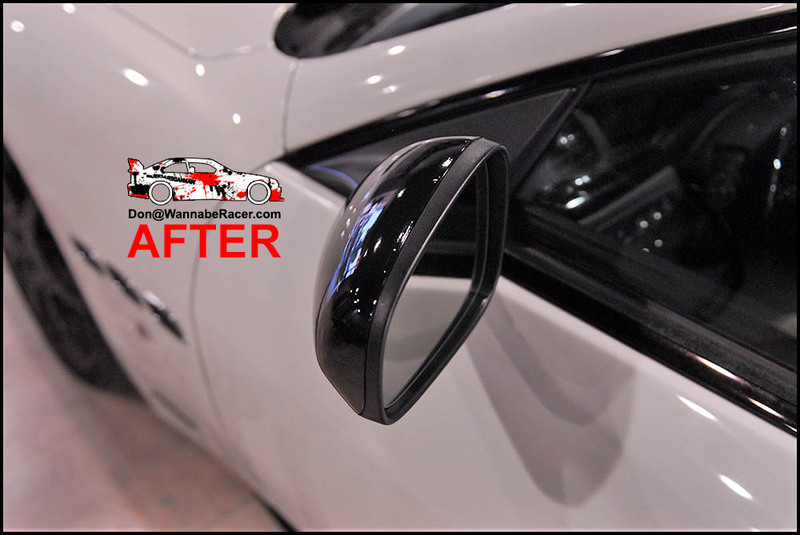 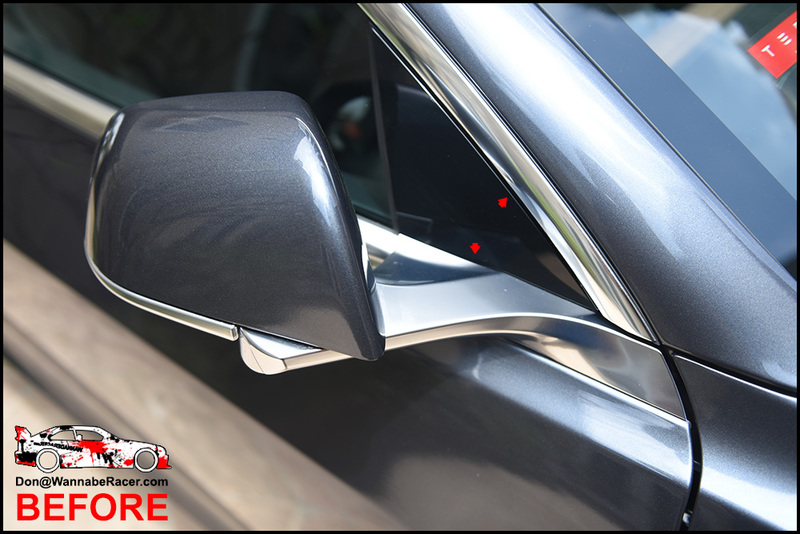 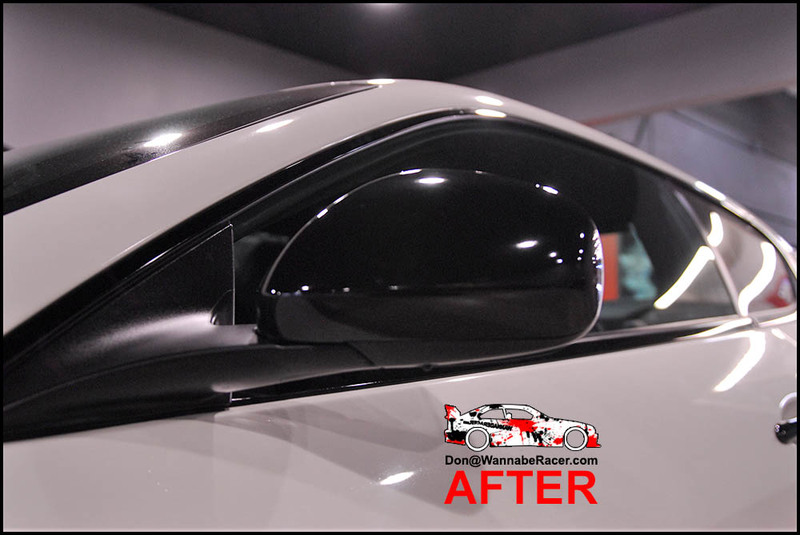 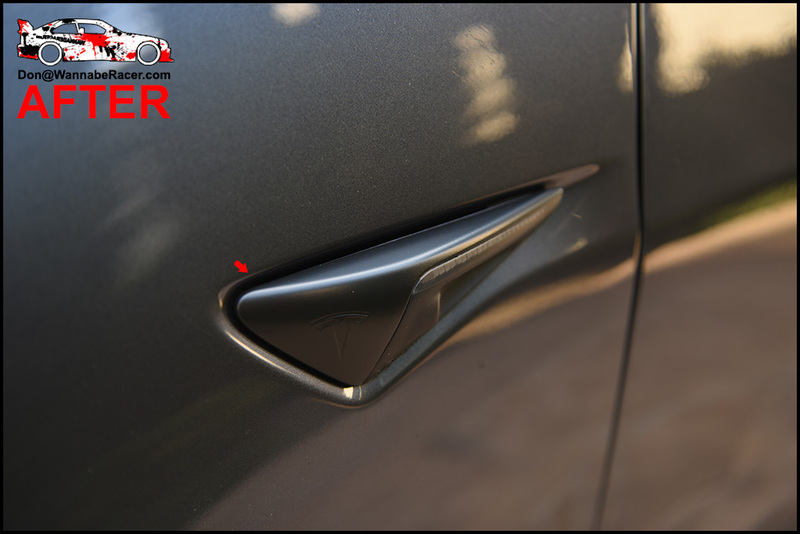 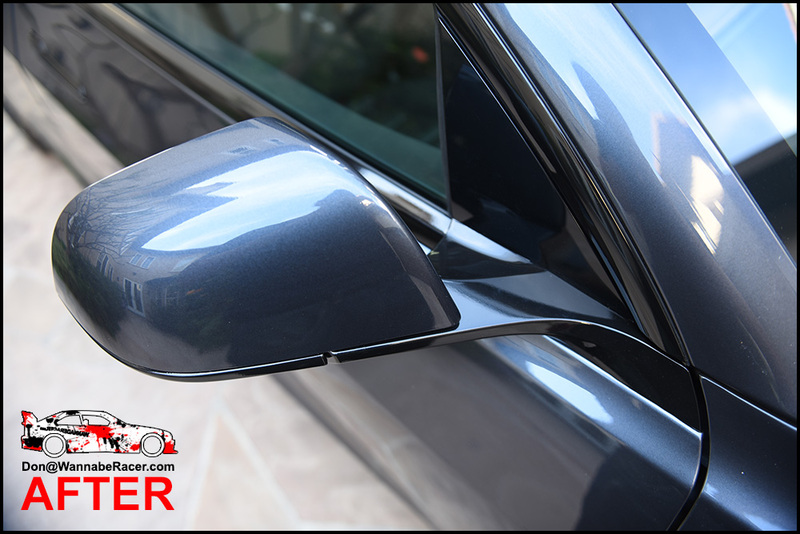 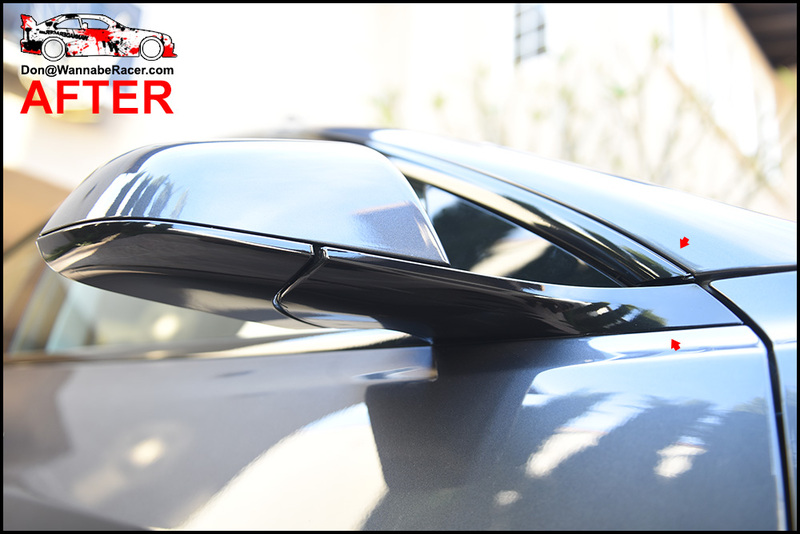 Starting out with some simple accents, we decided to go with wrapping the mirrors, door handles and side skirts in a gloss black vinyl finish. 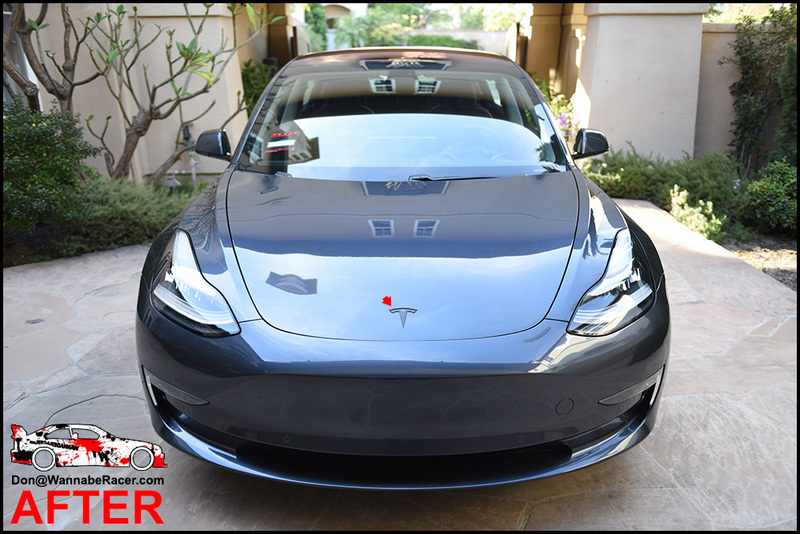 The gloss black finish went well with the already gloss black wheels. 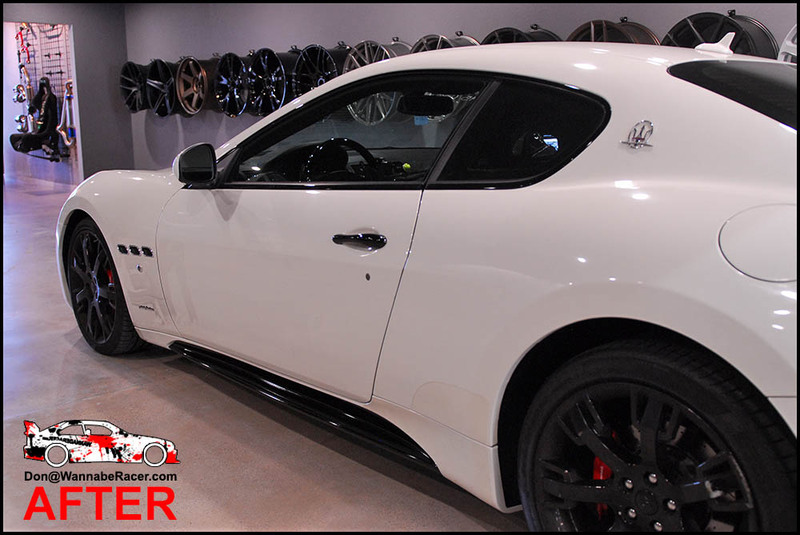 For this white Mercedes Benz C63 coupe, we vinyl wrapped both the roof and window trim in a gloss black vinyl wrap finish, which gave the car a finished panoramic look for the roof and matched the gloss black window trim that comes on the night packages from Mercedes. 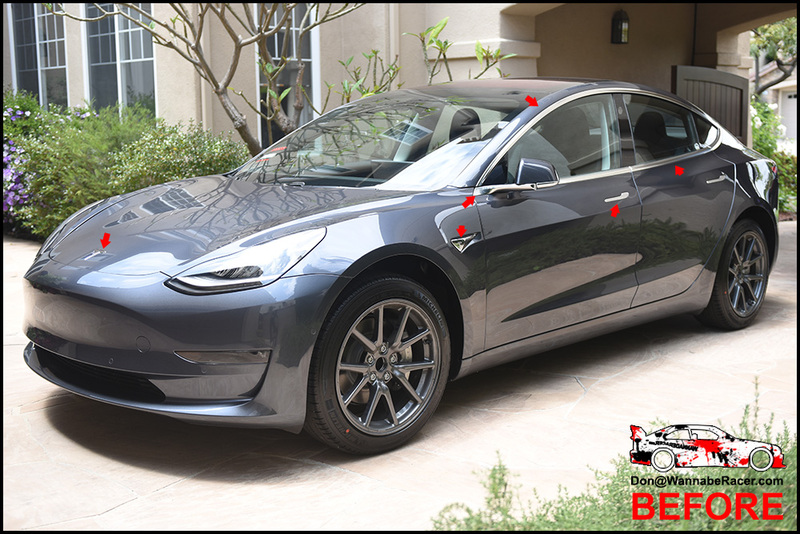 In addition to wrapping those pieces, we also blacked out the side fender badges and rear trunk badges, but leaving the rear star and front grill/hood star emblems chrome still. 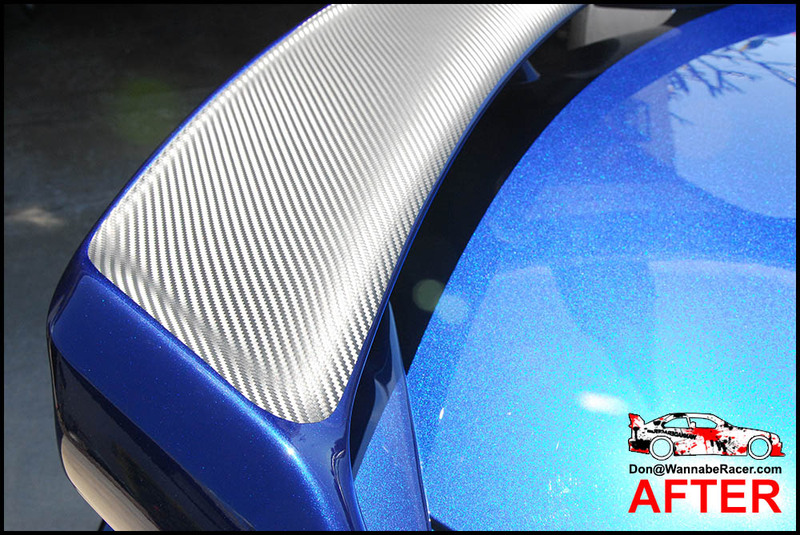 Instead of blacking everything out, some chrome accents were left over to provide some contrast still. 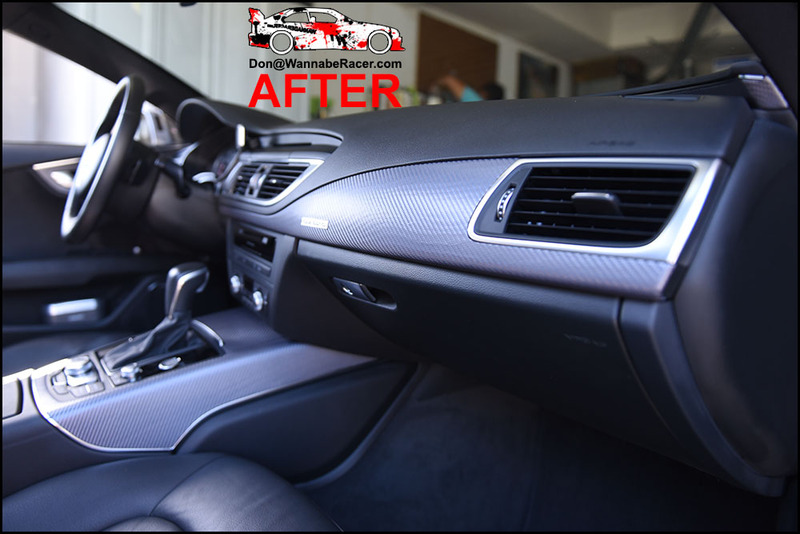 The owner of this car was from Pasadena Los Angeles and came out to us in Anaheim Orange County to have the work done on their car. 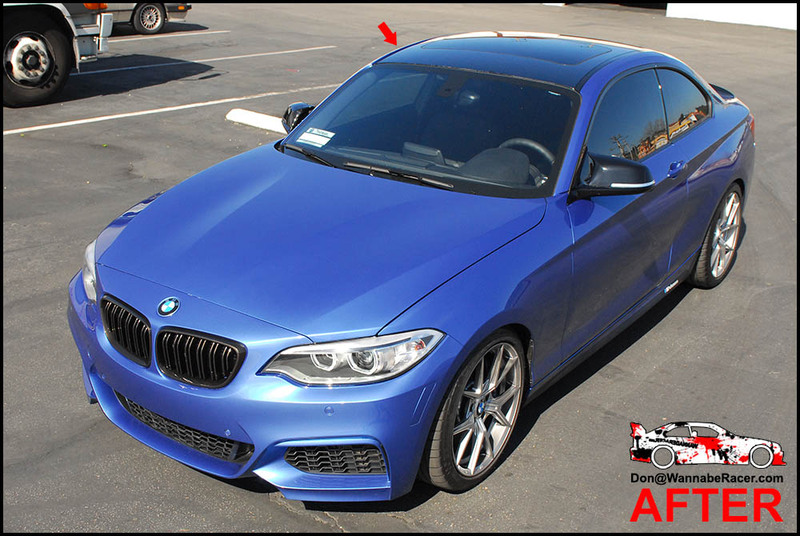 For those who have blue cars out there, typically a gloss black or similar roof wrap usually ends up being a more subtle touch to the car than how a black roof looks on a lighter colored car like white. 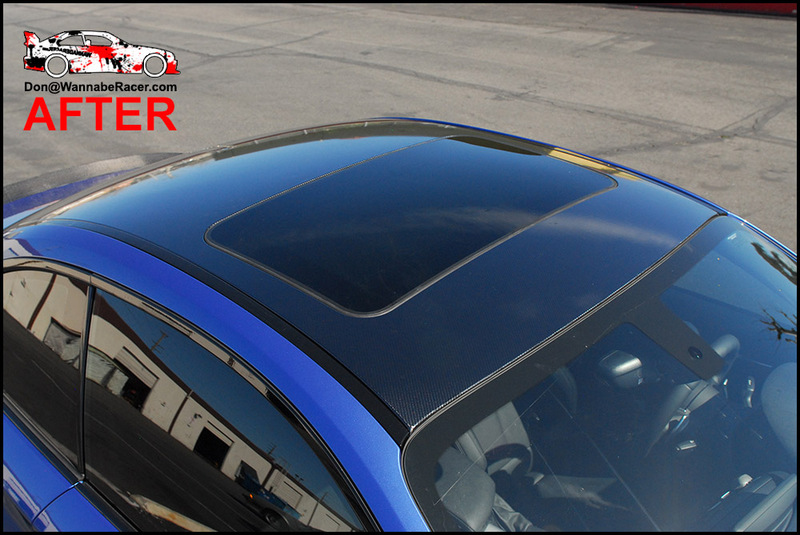 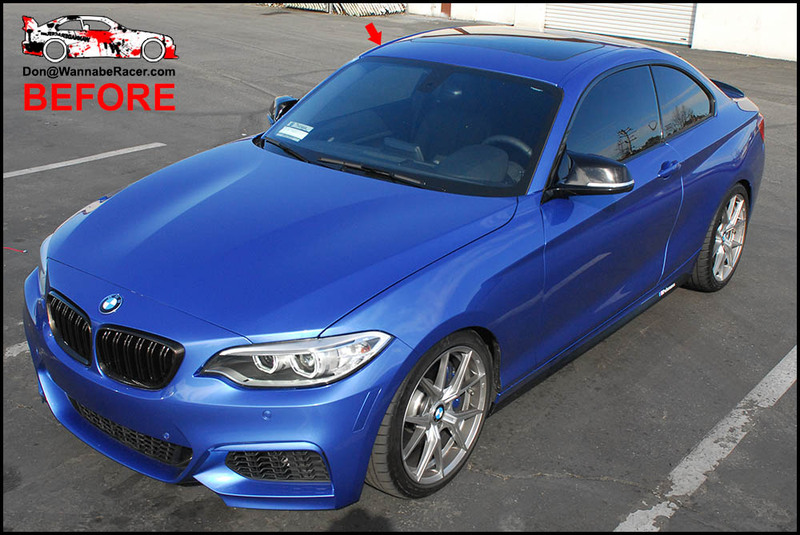 In this case, the owner of this estoril blue M235i coupe wanted something that stood out just slightly more than a regular gloss black roof, so we went with the 5D gloss carbon fiber on the roof. 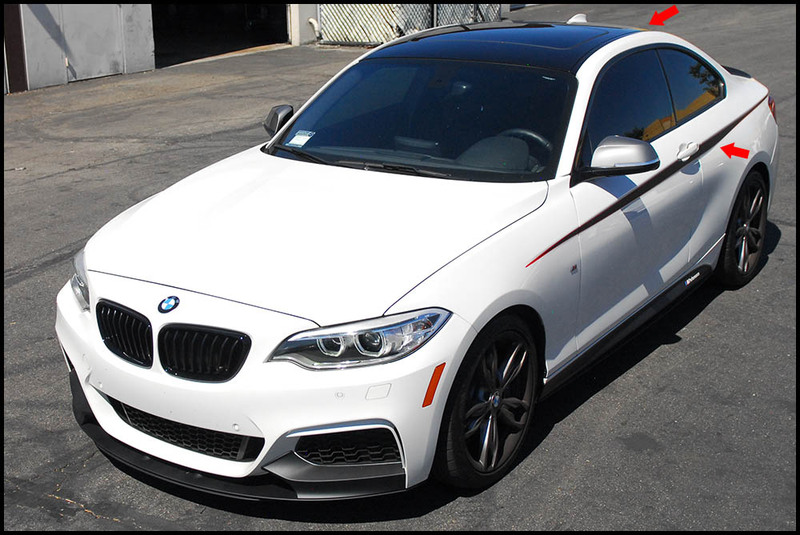 The owner of this car was from long beach Los Angeles and came out to me in Anaheim Orange County to have the vinyl wrap work done. 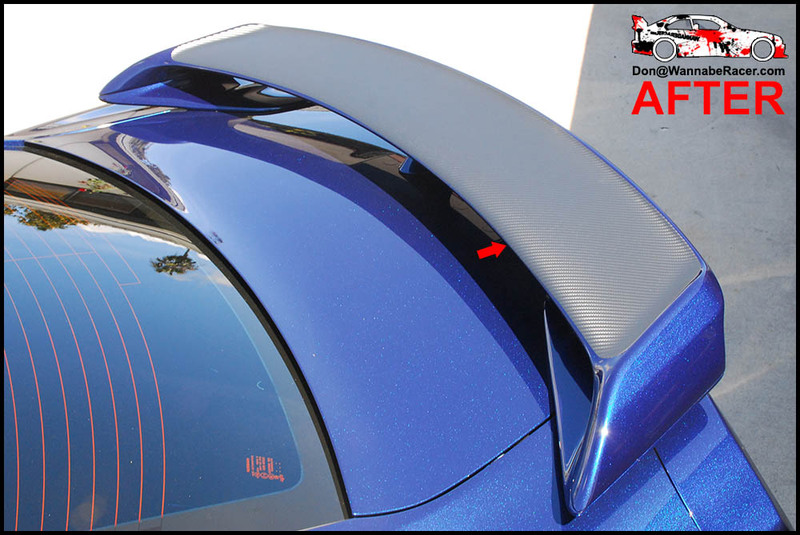 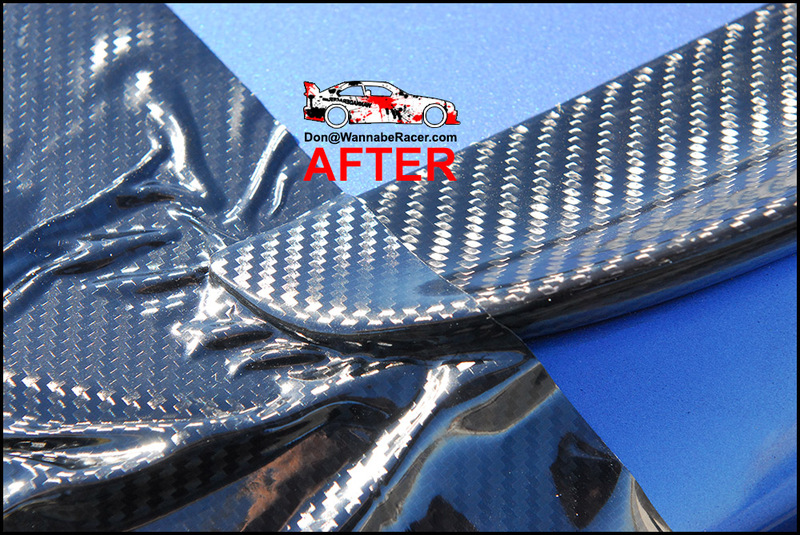 Since a lot of people ask how my gloss carbon fiber finish compares with real carbon fiber finishes, I took a few pictures of my gloss carbon fiber material laid over the real carbon fiber rear spoiler that was on the car. 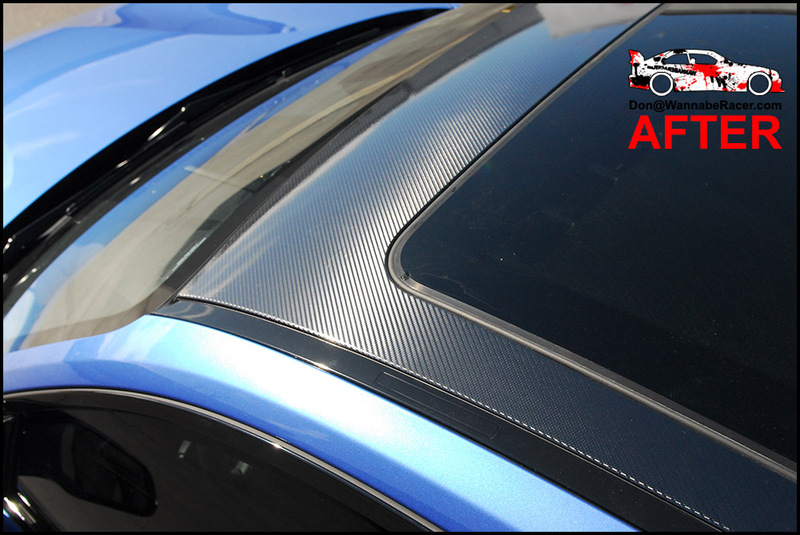 For a vinyl wrap product, this material is going to get you very close to the real thing. 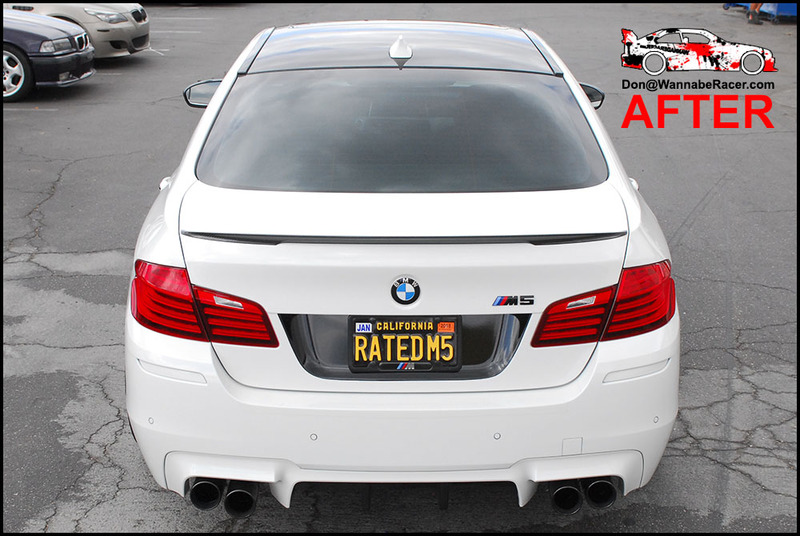 Here is a white Mercedes Benz C63 sedan that I had worked on during one of my trips up to norcal / bay area to do wraps up there. 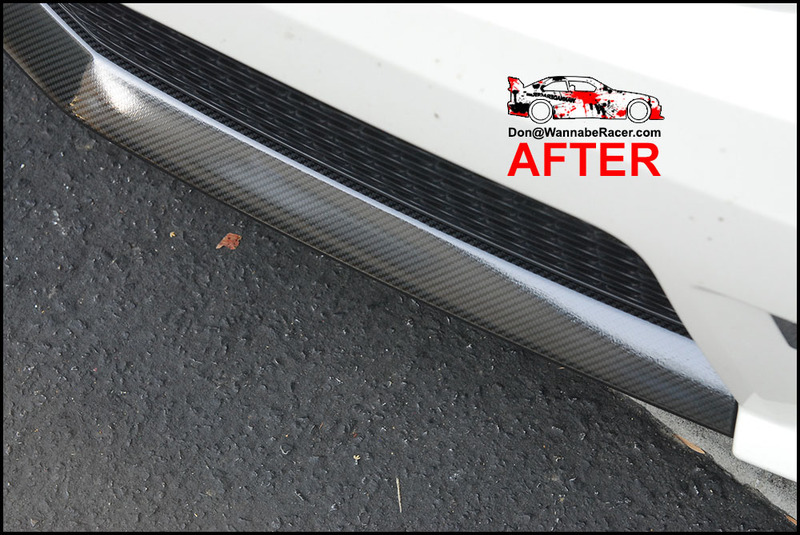 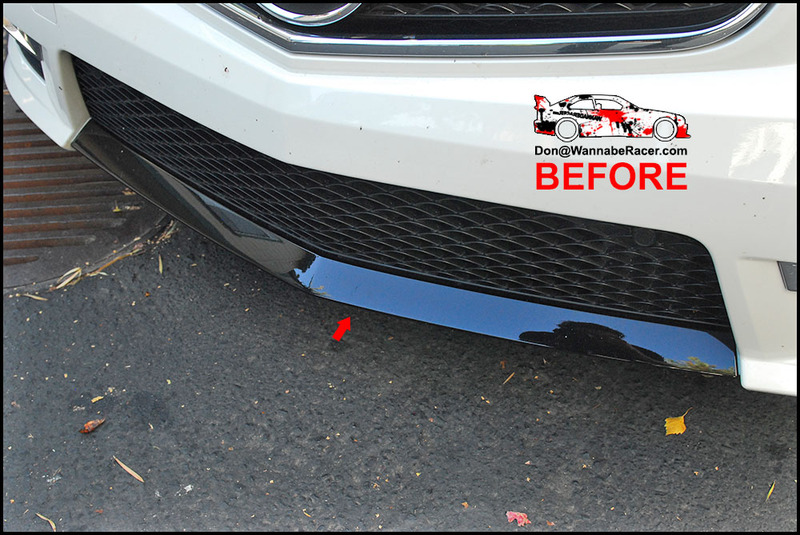 The owner of this car simply wanted to add just a simple carbon fiber accent to the front bumper area of the car, so we ended up going with the 5D high gloss carbon fiber finish over the factory black painted portion. 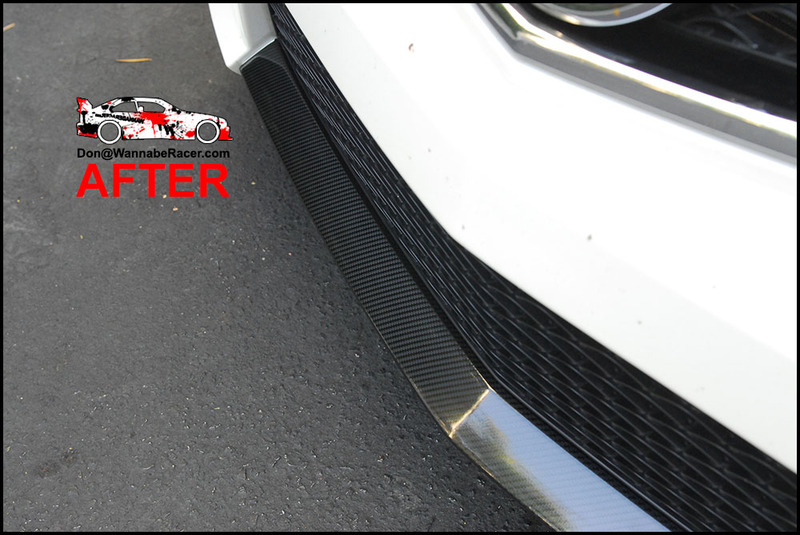 It's a subtle touch that is not always noticeable right away, but at the right angles and lighting, the carbon fiber weave shows up fairly nicely. 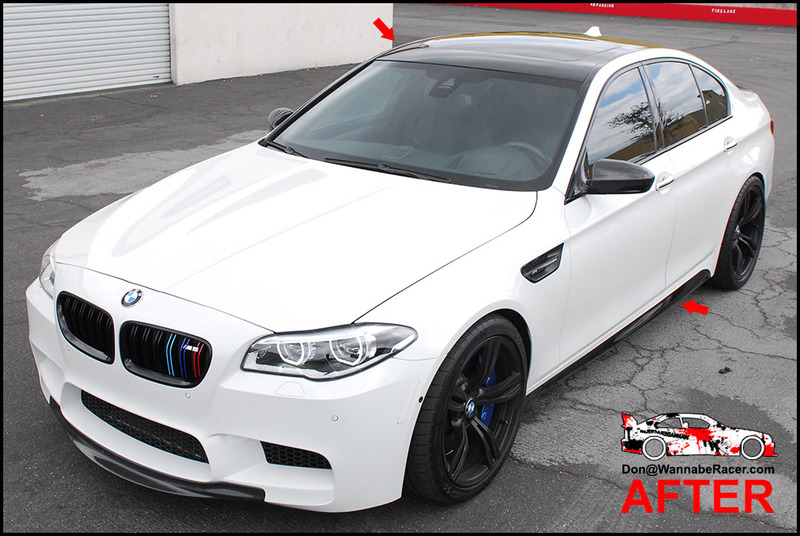 The owner of this car was from norcal and had me do the vinyl wrap work on his car while he was down in socal. 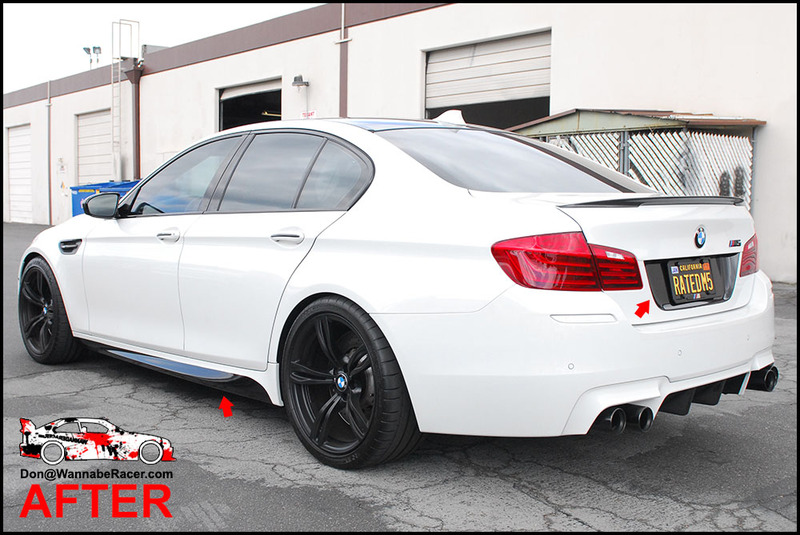 We went with gloss black for the roof, side skirts, and rear trunk license plate area. 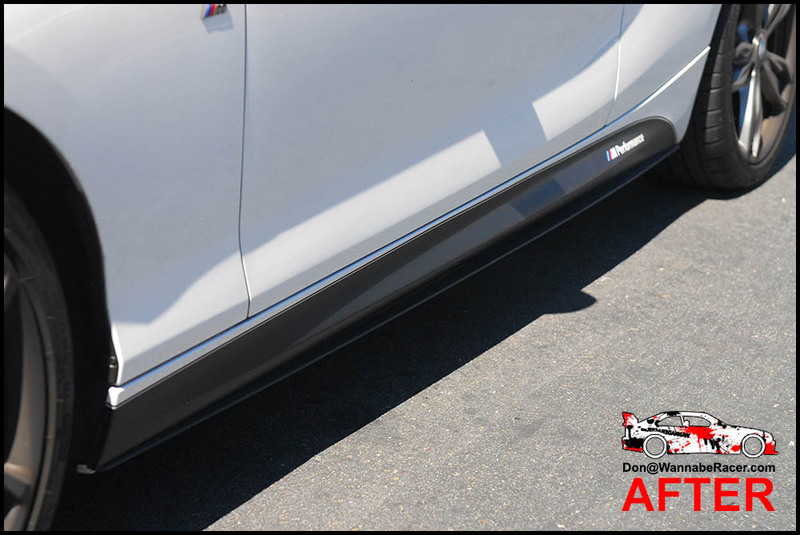 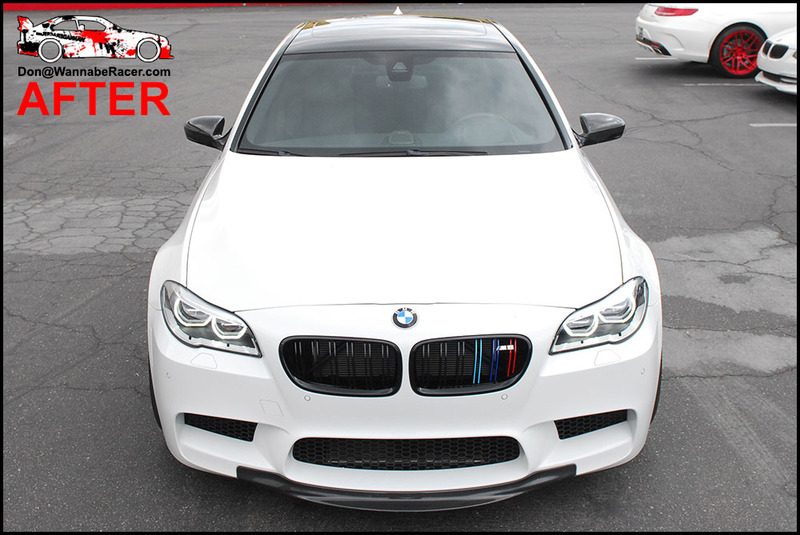 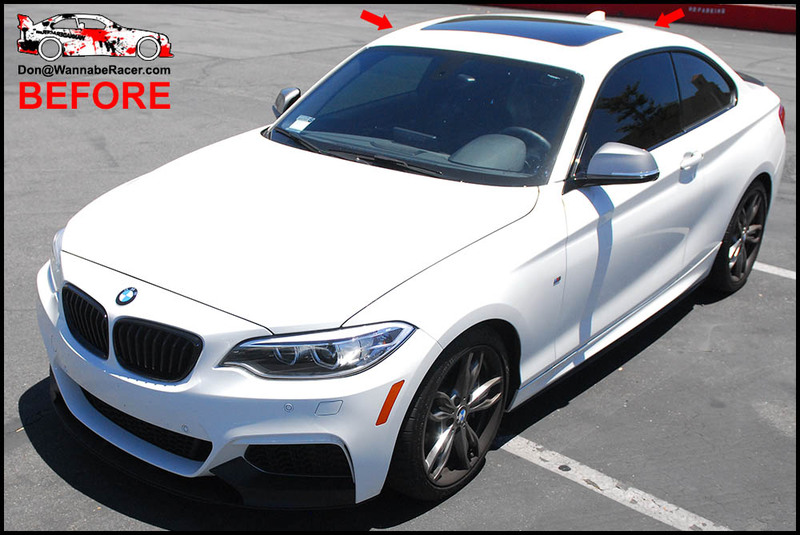 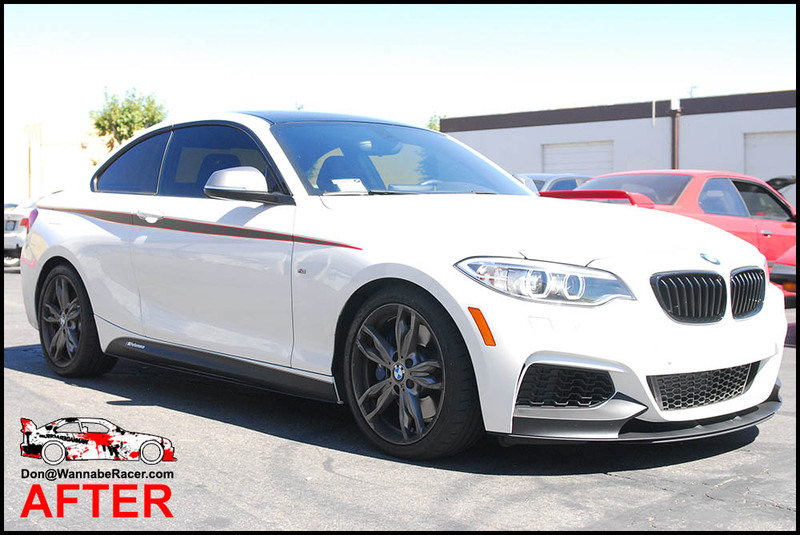 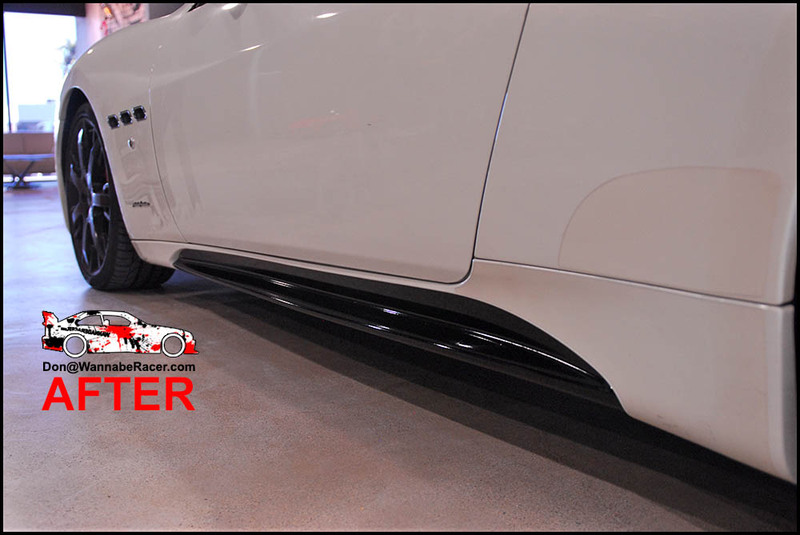 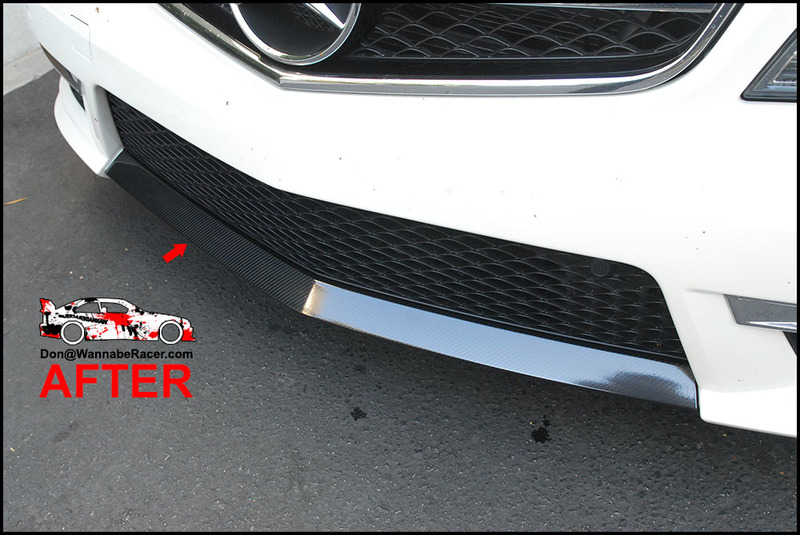 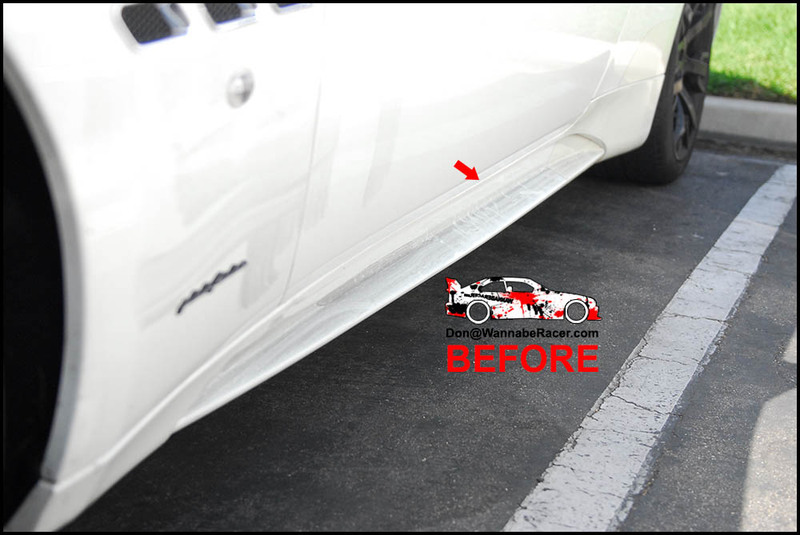 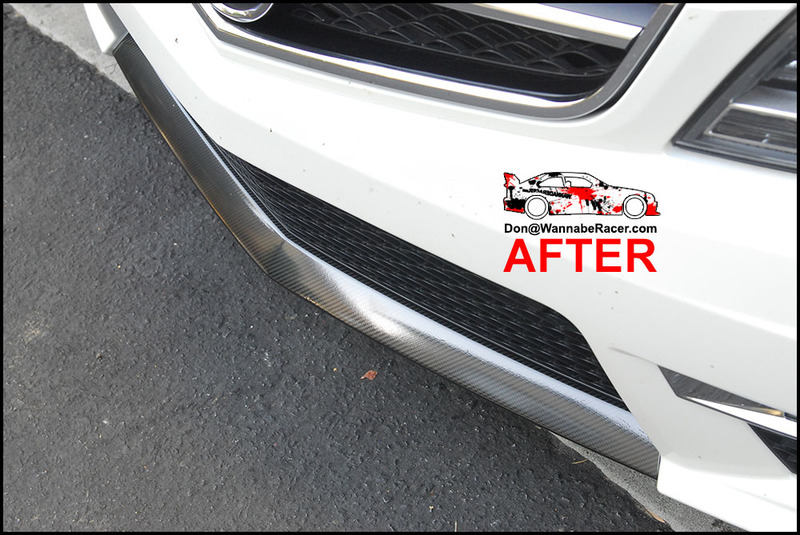 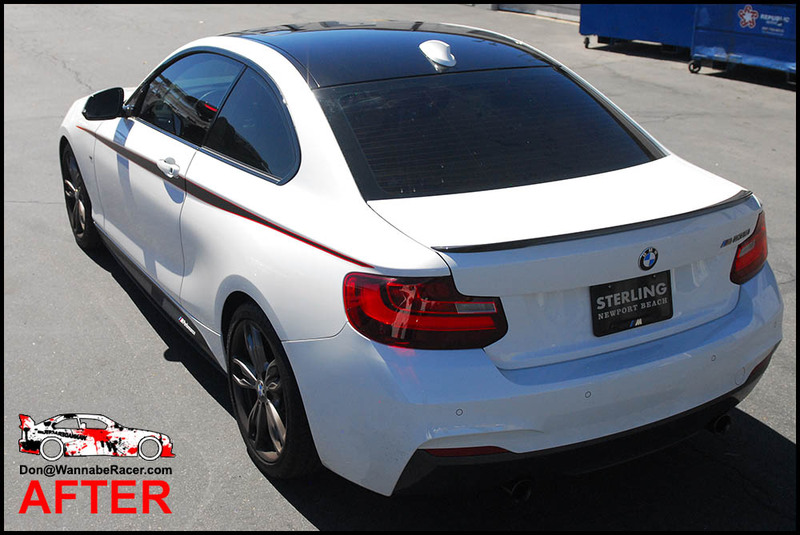 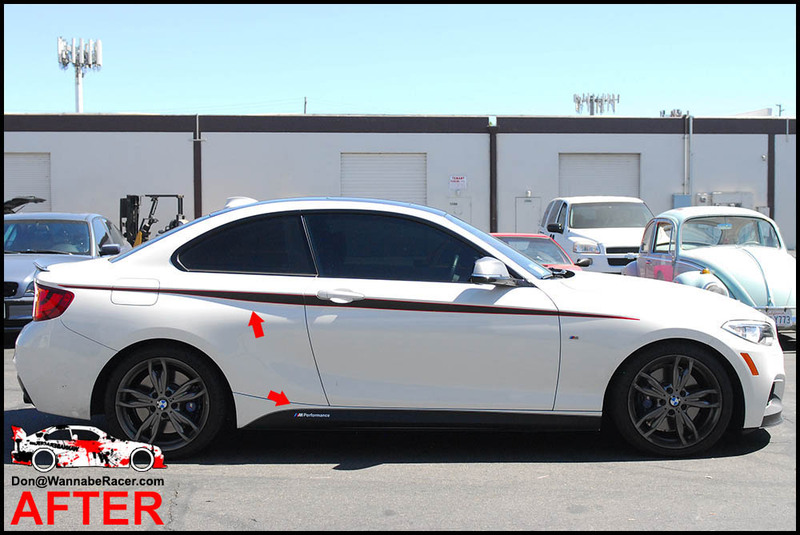 The side skirt design is based off of the motorsport graphic that is also offered from the factory by BMW. 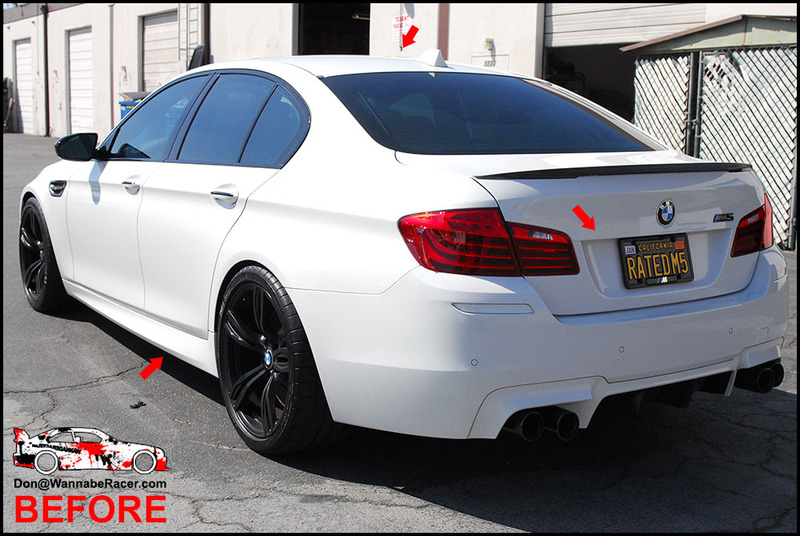 The rear license plate and side skirt wrap was a last minute decision, so those were done freehand. 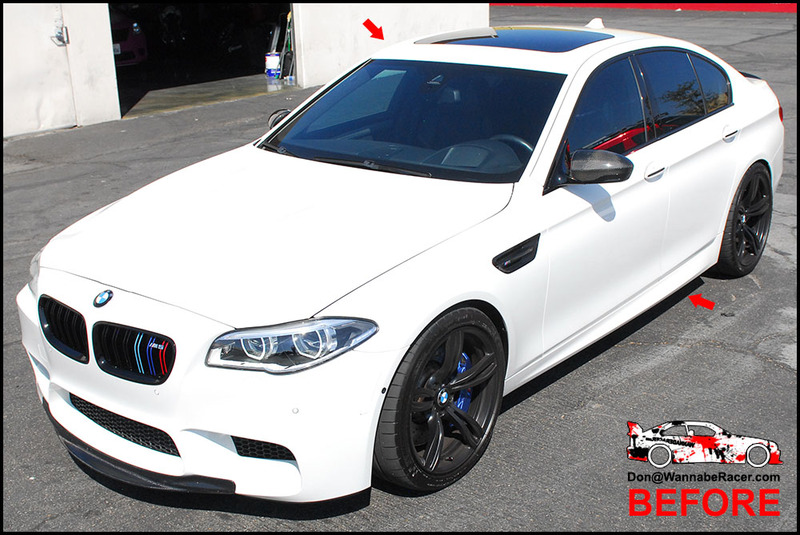 Overall, the additional gloss black accents tied in well with the other gloss black pieces on the car. 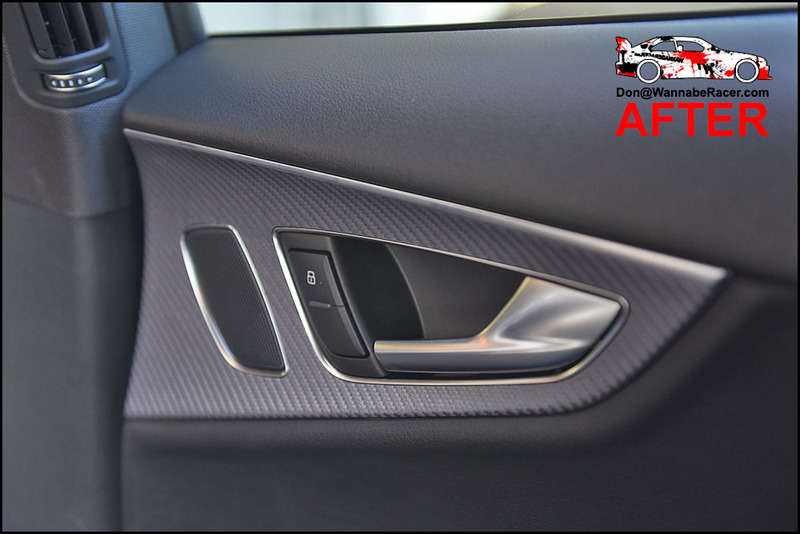 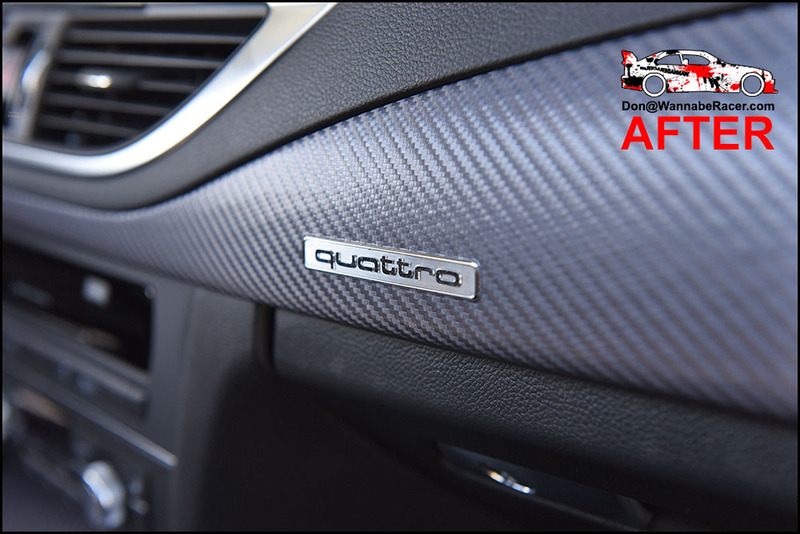 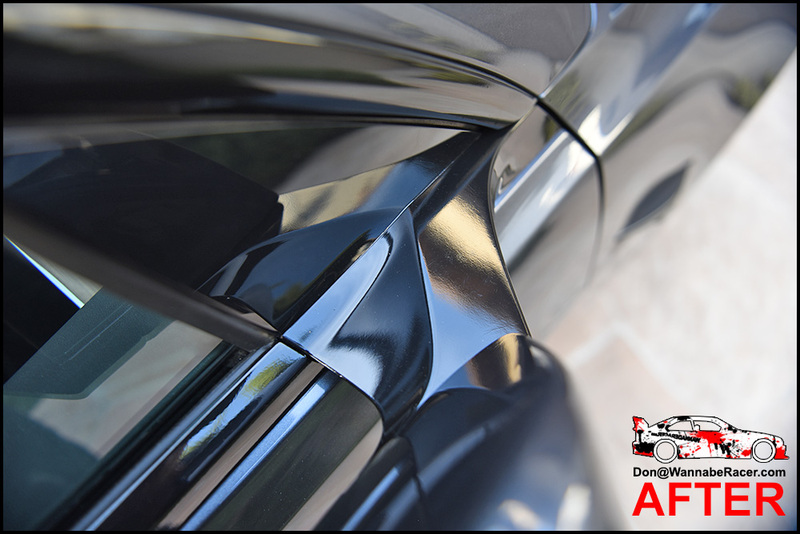 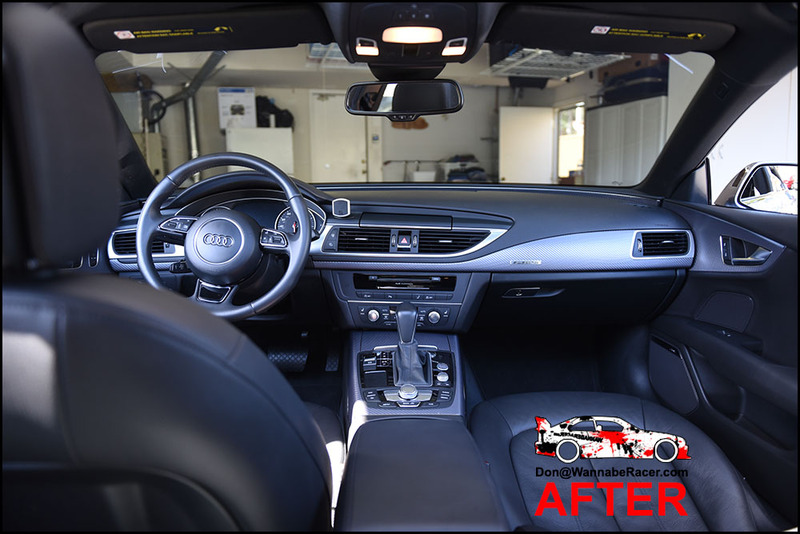 For this 2016 Audi A7 sedan, we wrapped over the original wood trim pieces with the 3M 1080 CFS201 anthracite carbon fiber vinyl material. 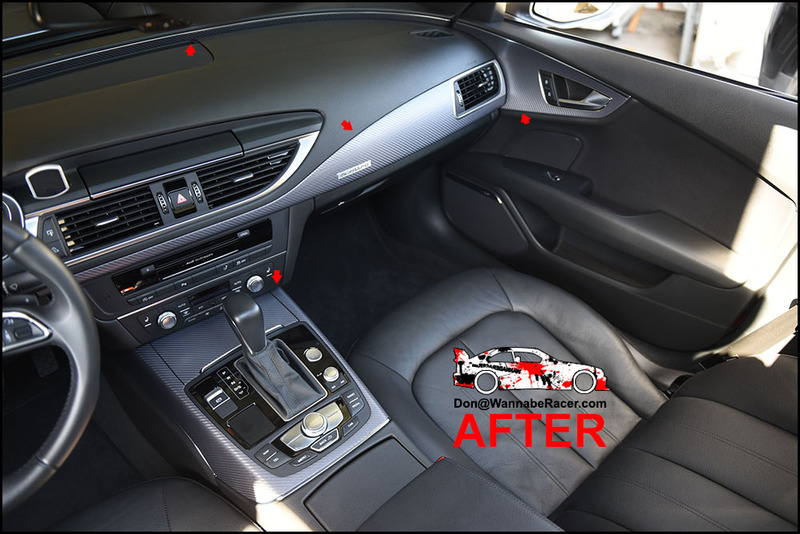 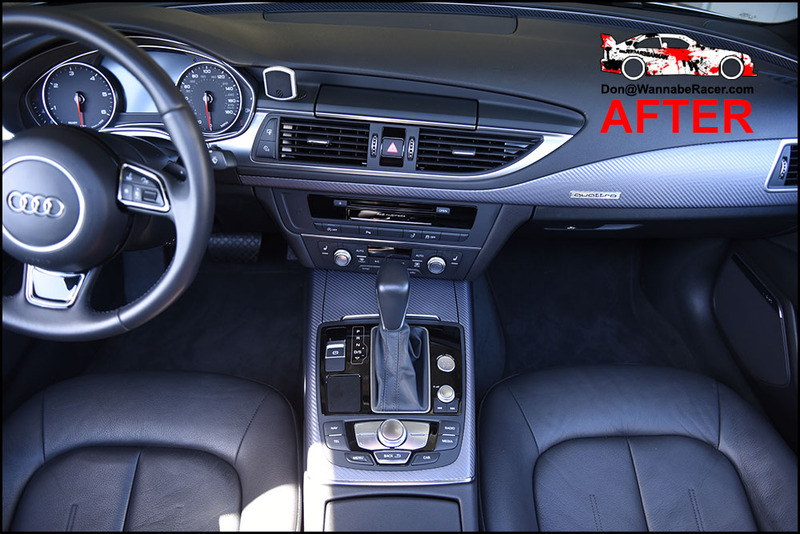 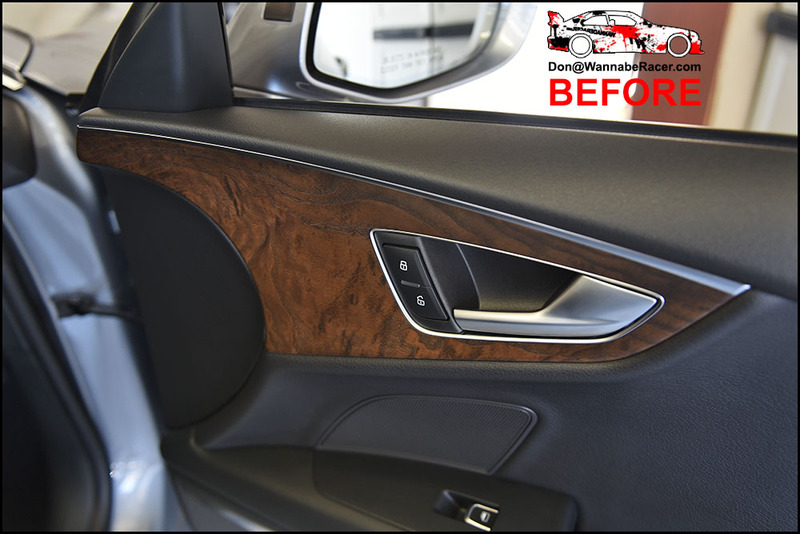 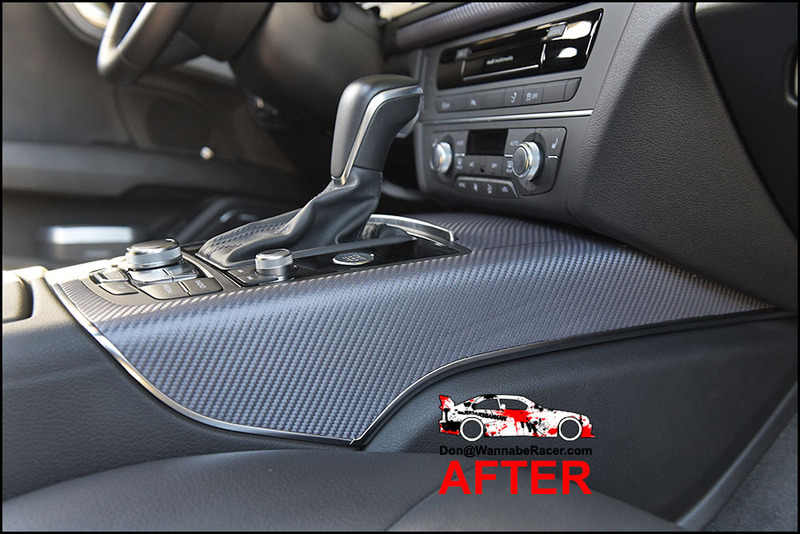 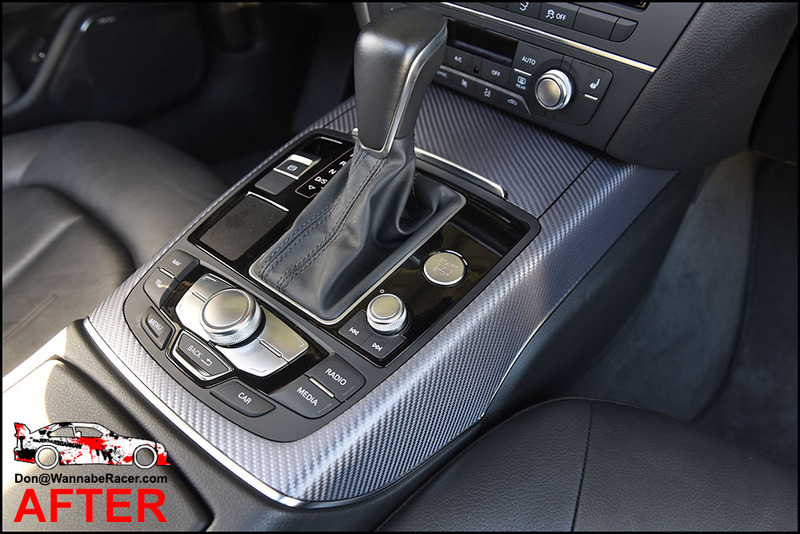 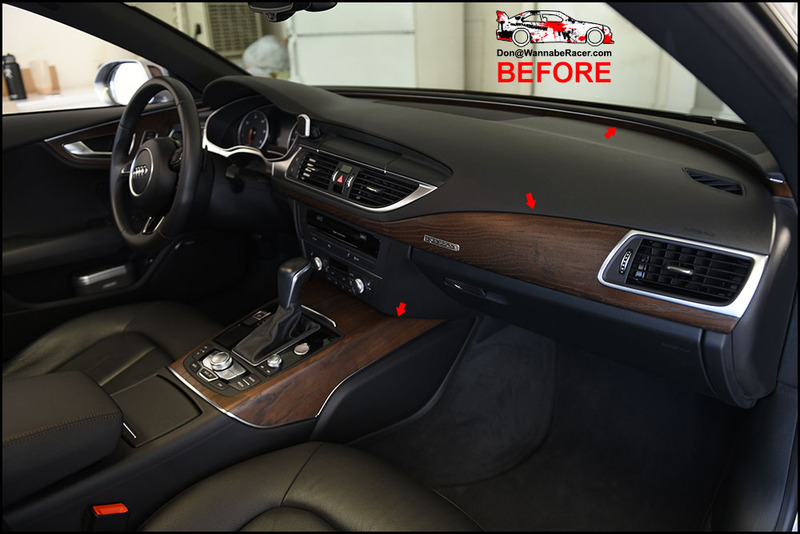 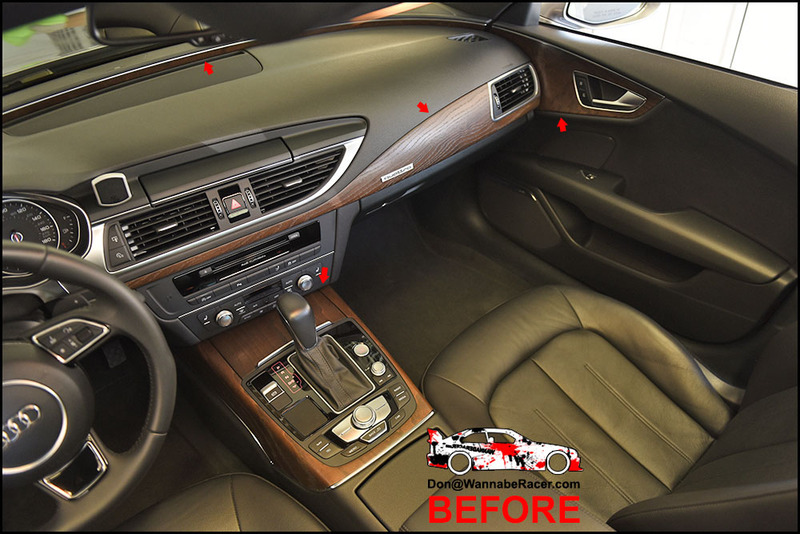 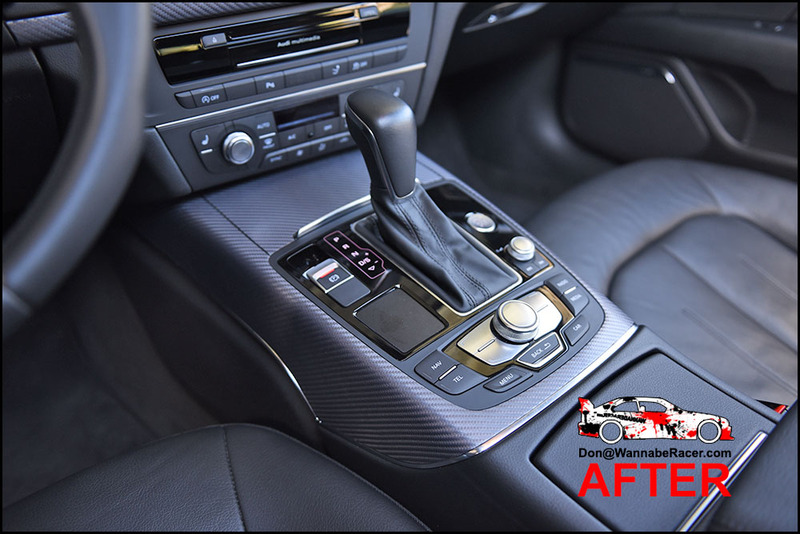 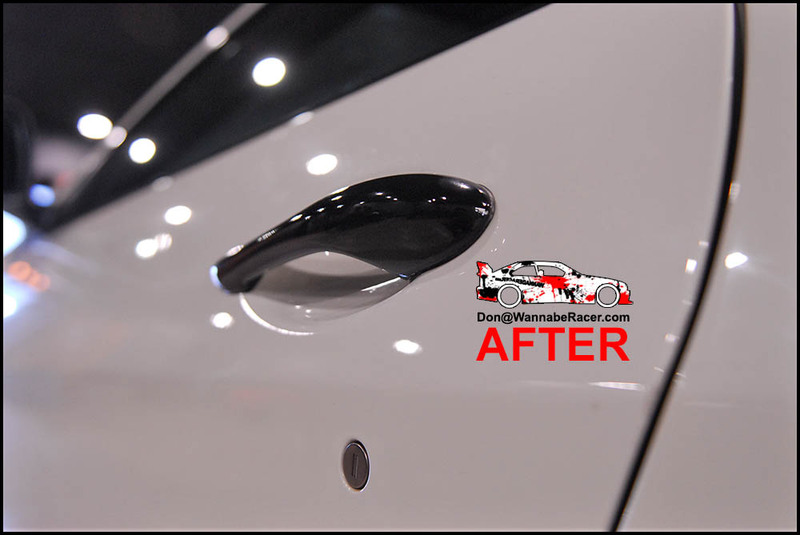 Getting rid of the wood look on the interior trim really upgraded the look of the overall interior, giving it a sportier look and feel. 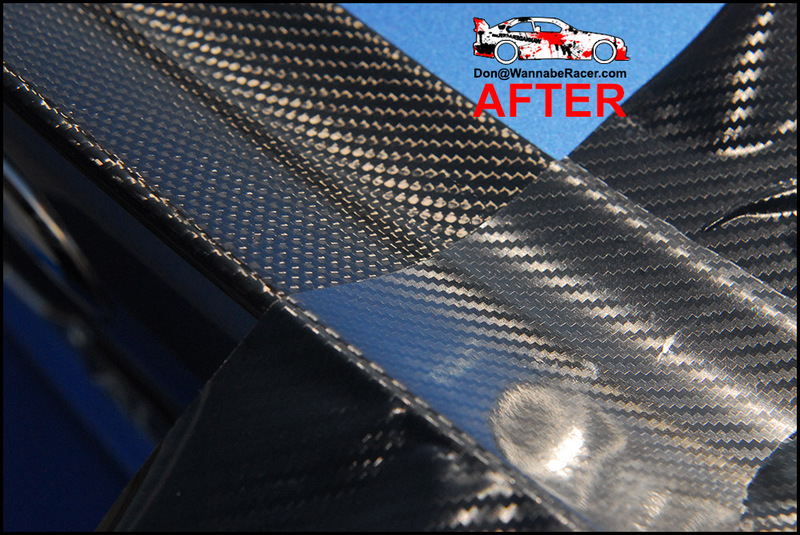 I especially liked the way the carbon fiber wrap worked with the aluminum metal trimming that were already on the wood pieces, giving it a nice balance of carbon fiber and metal. 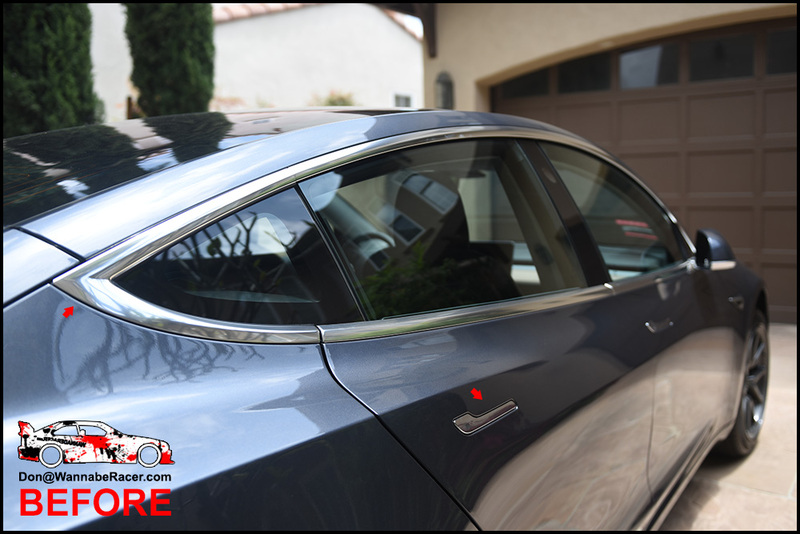 I've been doing quite a few Teslas lately, with them becoming more an more common. 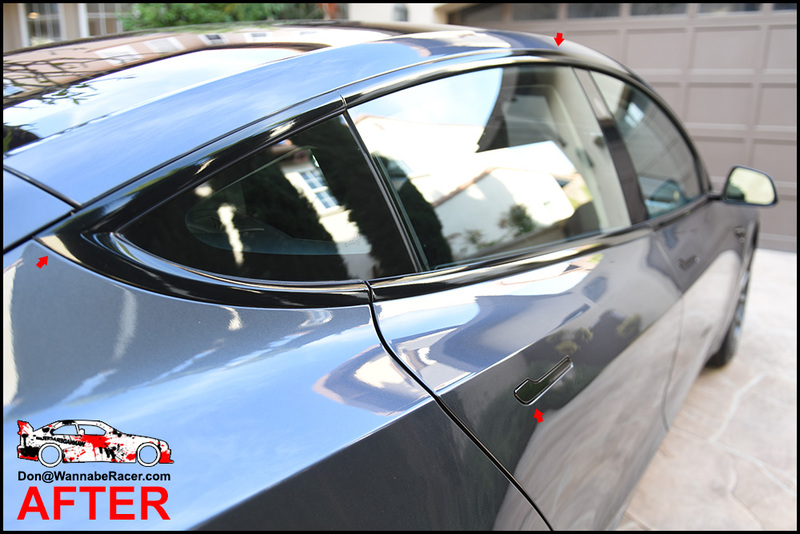 The chrome on the Teslas are generally more tricky/tedious to do, but I've managed a good system to get good results consistently for these cars now. 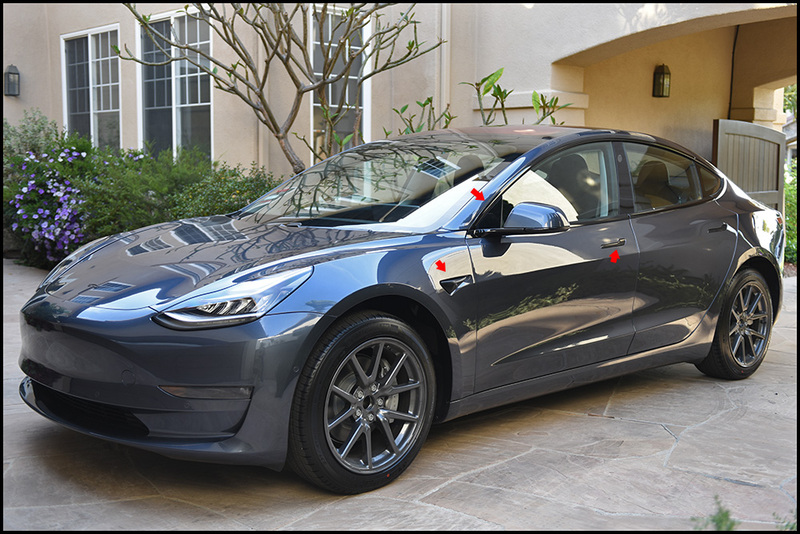 The owner of this Tesla Model 3 wanted to black out all of the exterior chrome pieces on the car. 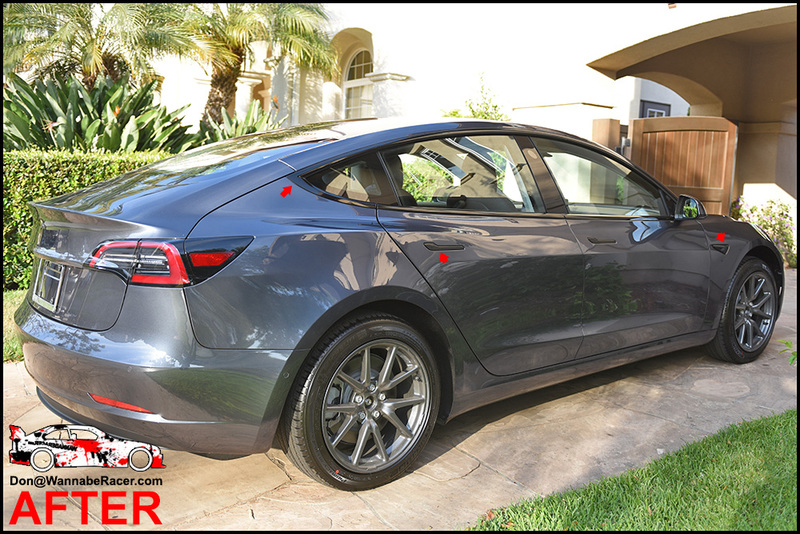 Blacking out all of the chrome pieces on the car really gives the Tesla a sportier look and feel. 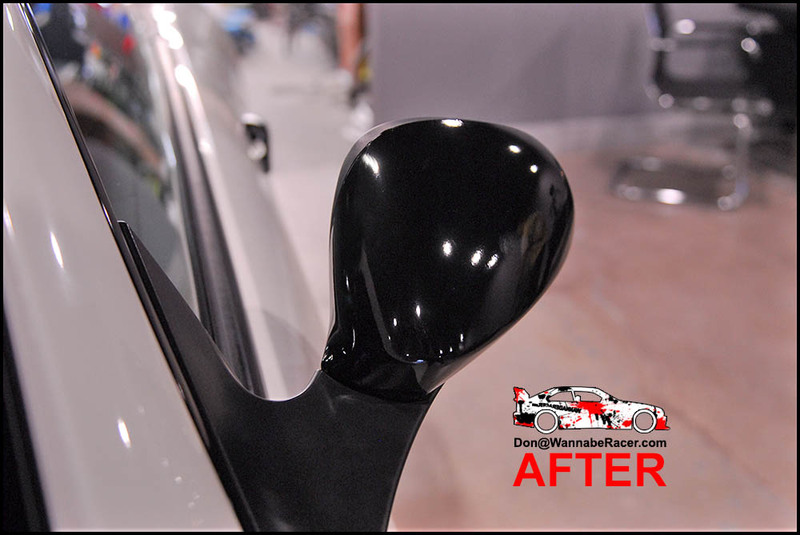 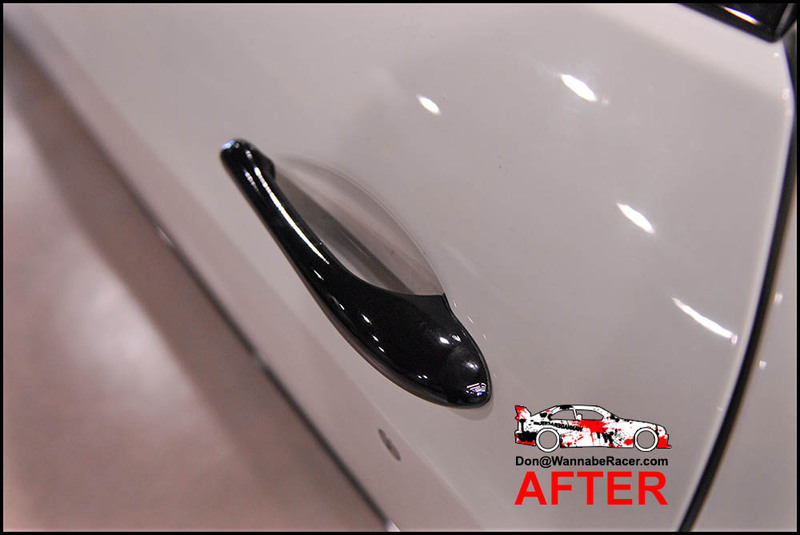 We did a mixture of matte black and gloss black on various areas of the car, depending on what matched and worked best for those pieces. 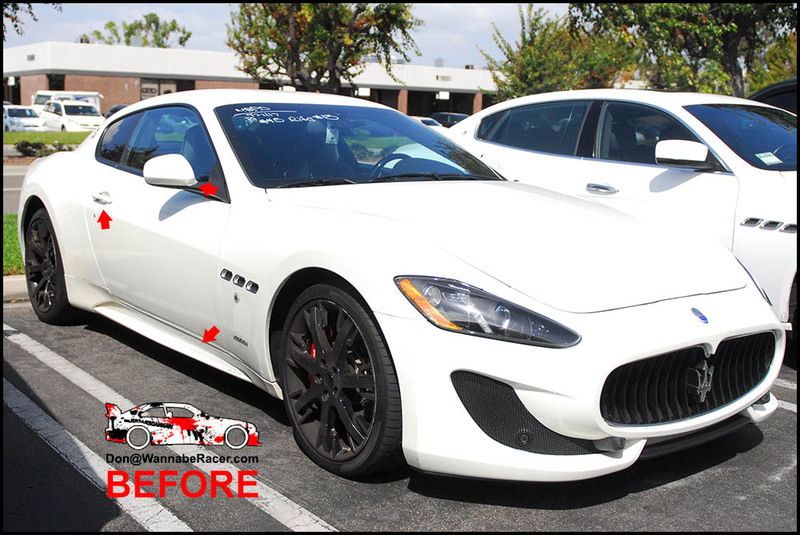 The owner of this car was in Irvine Orange County and I came out to them to do the chrome delete vinyl wrap on their car.